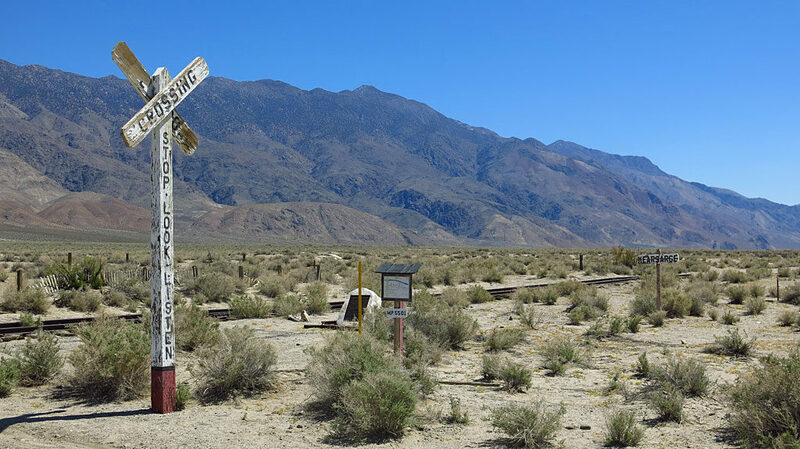 We’ve been unintentionally staying at all the little towns which line California Highway 395 on the eastern side of the Sierras. Over the Martin Luther King holiday, we adopted Independence as our temporary home, a town which has been around since 1861. As always, our basic MO will be wandering, exploring and maximizing fun. In an effort to kill time before hotel check-in time, we stopped by the Mt. Whitney Fish Hatchery. 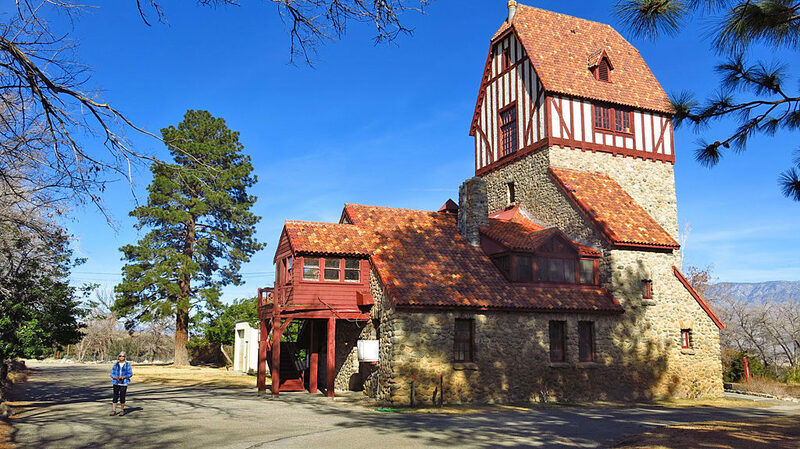 When construction was completed in 1917, it was the largest and best equipped hatchery in California and could produce 2,000,000 fish fry per year. Unfortunately were were visiting during a time of year when tours are not available, so we wandered the exterior, peering into windows like a Peeping Tom. 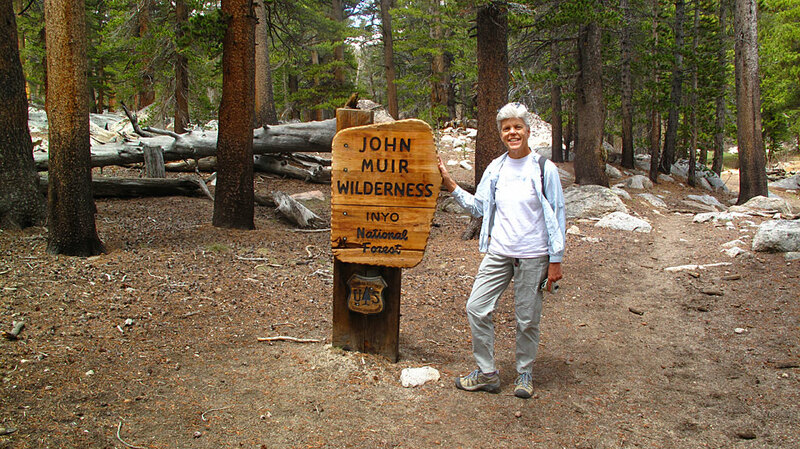 Our traditional “John Muir Wilderness sign photo” while hiking up the Baxter Pass Trail. 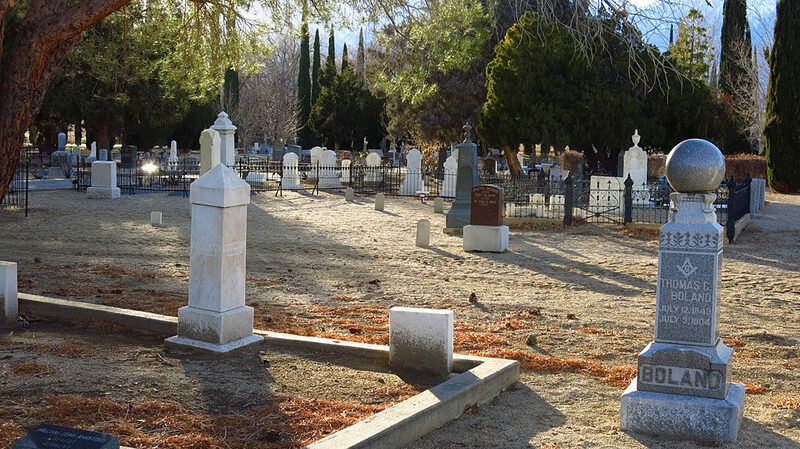 The Independence Cemetery — a couple blocks from our motel containing former residents who were miners and ranchers and soldiers. 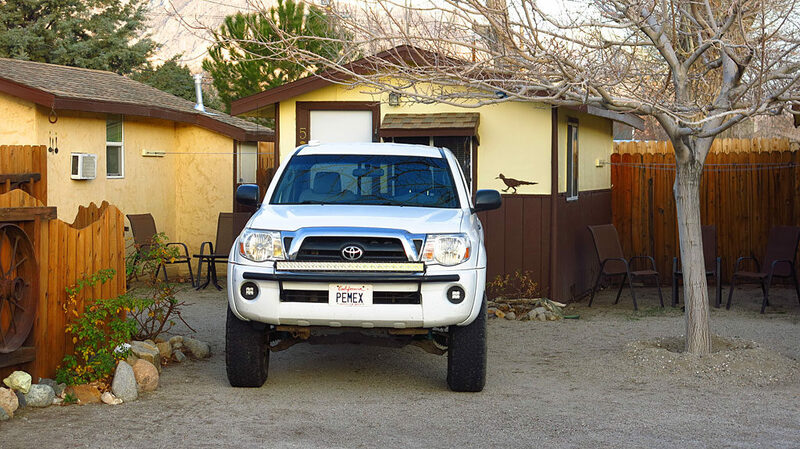 For the long weekend, we holed up in our cozy cabin (read: compact) at the Mt. Williamson Motel. 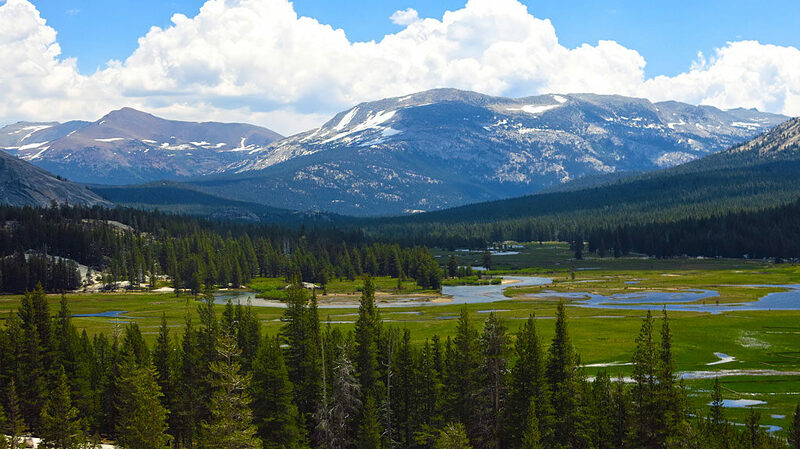 The location gave us easy access to both the Sierras and the White Mountains. 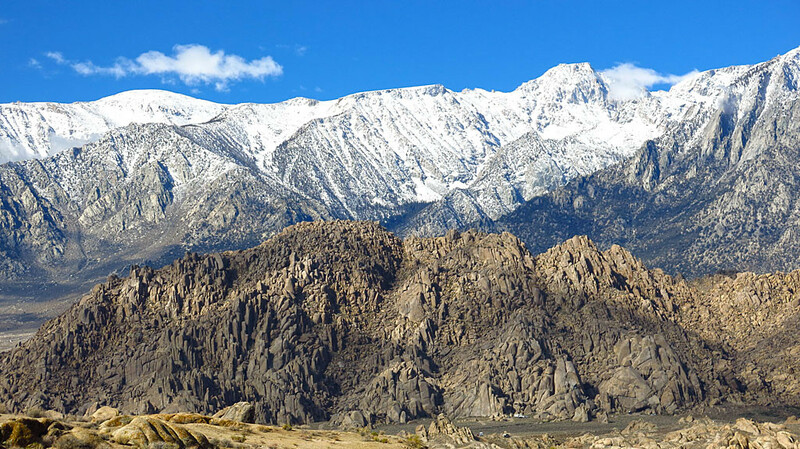 Walking outside our motel room and looking west, we were greeted by this morning view of the Sierras: Mt Bradley on the left; University Peak on the right. 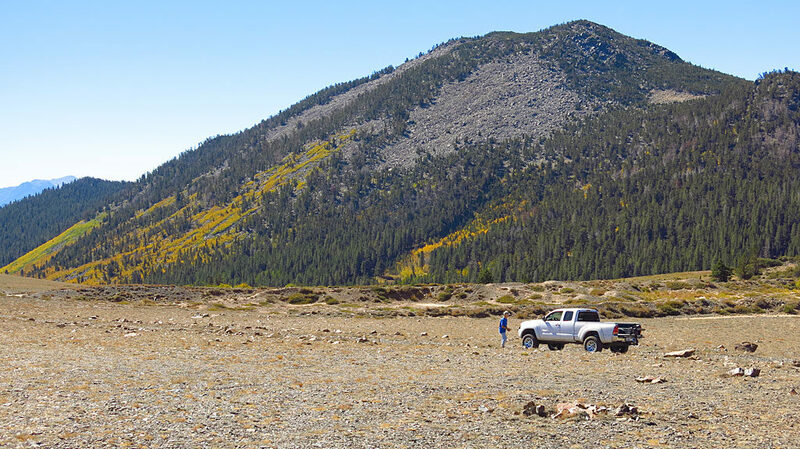 Our destination for the day was Mazourka Peak, a 9410′ hilltop in the White Mountains. 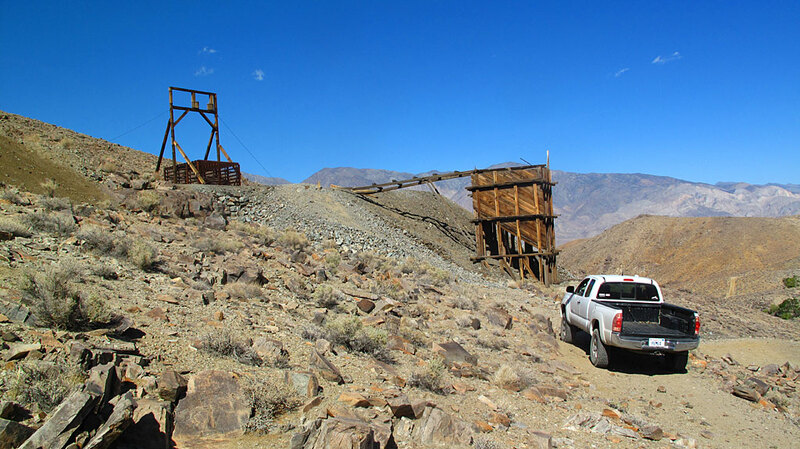 Heading up Mazourka Canyon Road, we first crossed the only remaining 100′ section of the Carson & Colorado Railroad at Kersearge Station. A simple museum, of sorts. 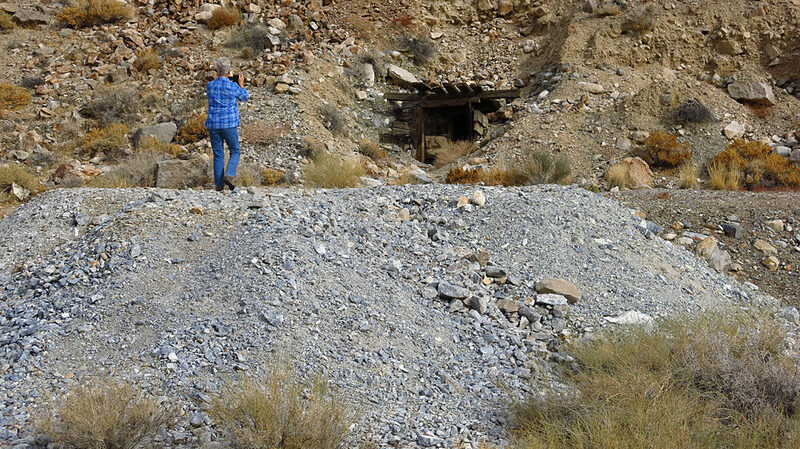 Our first stop up the canyon was at the Diggin’s, a semi-active mining claim with some left-over infrastructure. 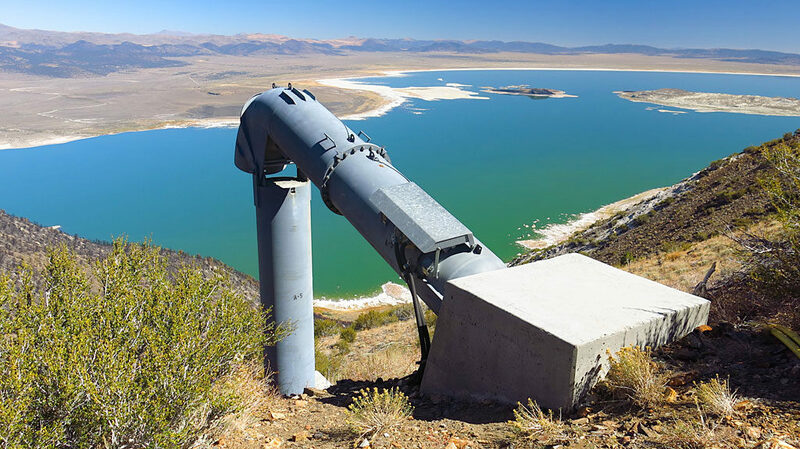 Water flowed from the locked-up mine, running past grape arbors and cottonwood trees. And that there is the Slim Princess. 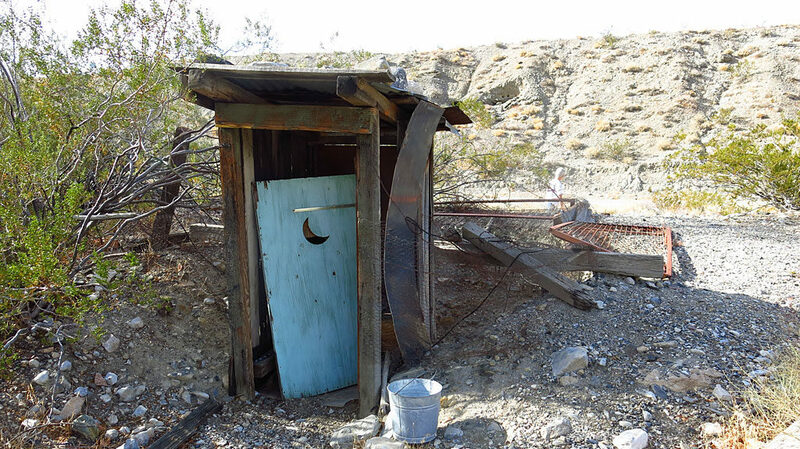 The guys at the Diggin’s were creative — they placed the sanitary facilities directly over an abandoned vertical mine shaft. Bombs away! 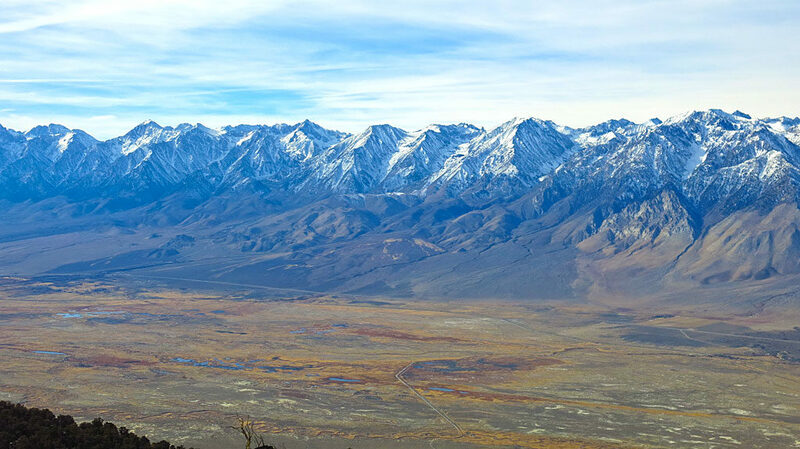 At the top of Mazourka Peak we were rewarded with spectacular views of the Eastern Sierras and Owens Valley. 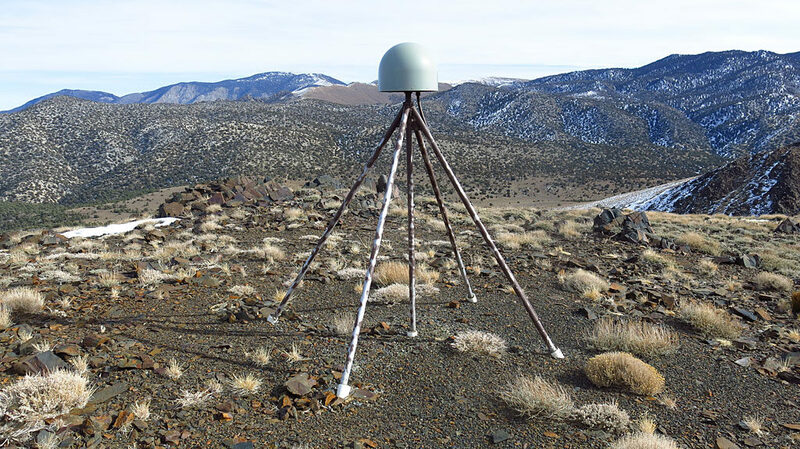 Along with hilltop communications equipment, we saw an EarthScope GPS monitoring station, keeping a watchful eye on our pesky tectonic plates. 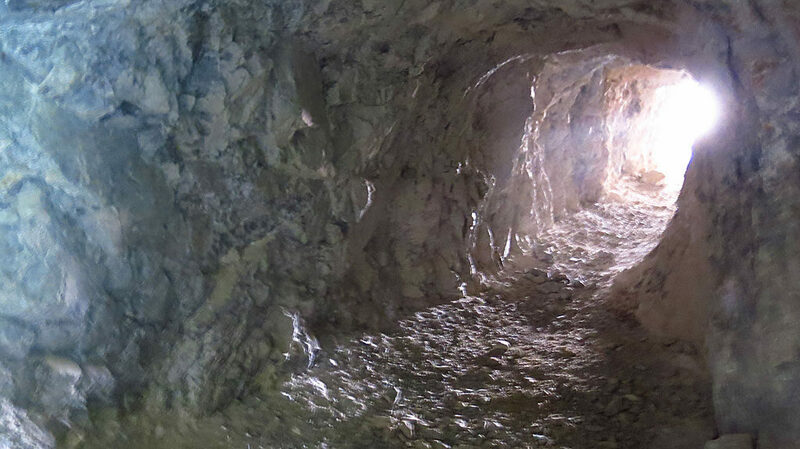 On the way back down Mazourka Canyon, we stopped to check out one of the many silver and lead mines in the area which had been worked for more than 100 years. 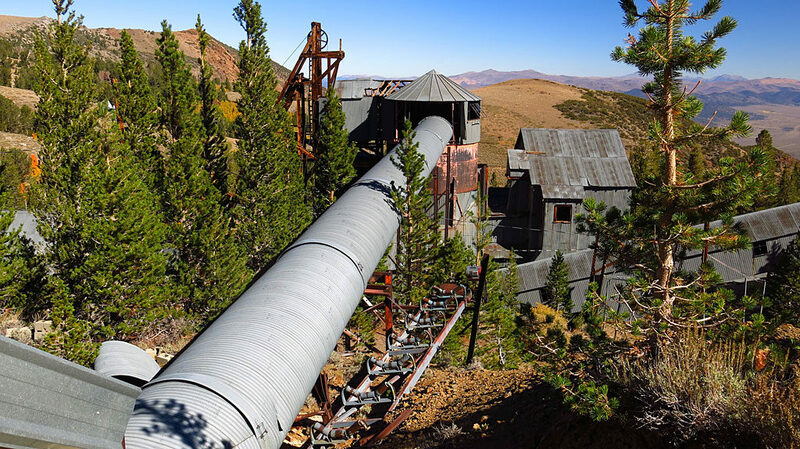 This mine went about 50′ into the mountain, then dead-ended. 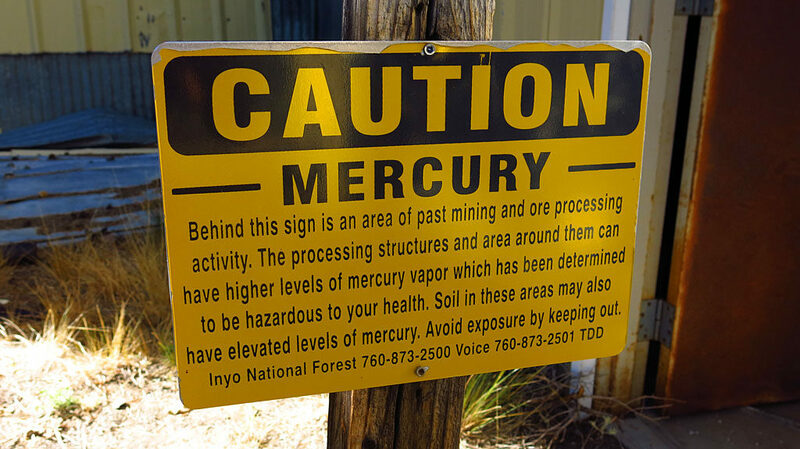 Remember kids, don’t try this at home — you’ll have to go to the desert and find your own abandoned mine. 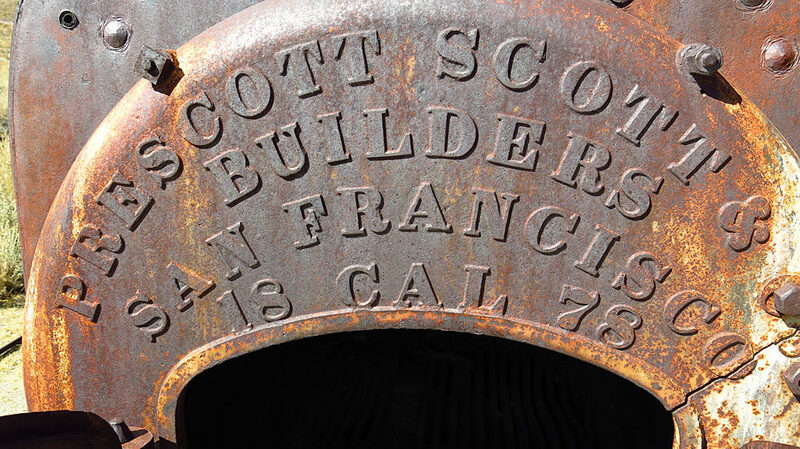 We took advantage of less-than-perfect weather to visit the Eastern California Museum in Independence. 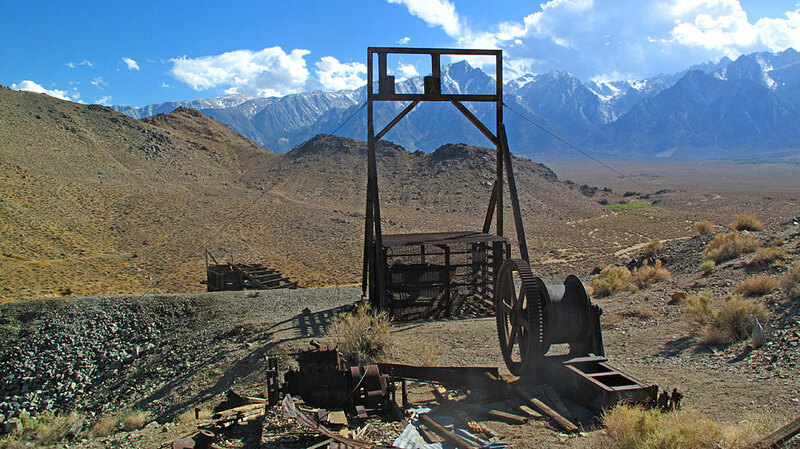 There were lots of cool exhibits including mining and ranching, and information about the Manzanar “relocation center.” Very interesting and well worth the visit. Sunday night dinner at the Still Life Cafe next door to the market. 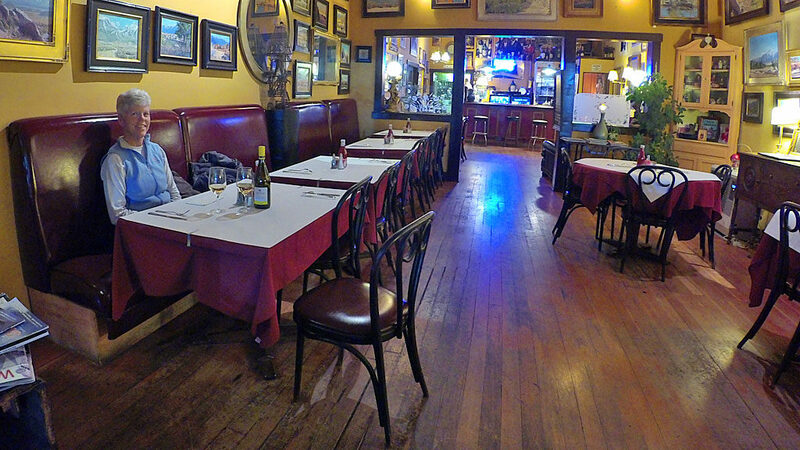 The owners are not without personality and they serve great food. 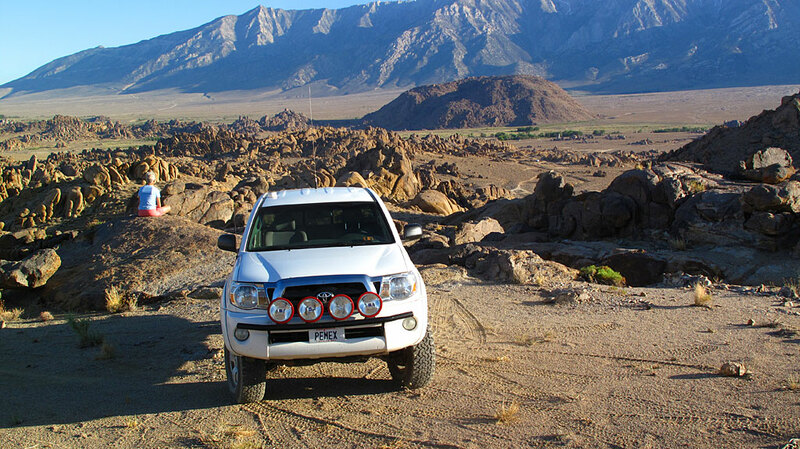 On the way home we opted to take Foothill Road to the Alabama Hills, paralleling Highway 395. More fun because it’s dirt! 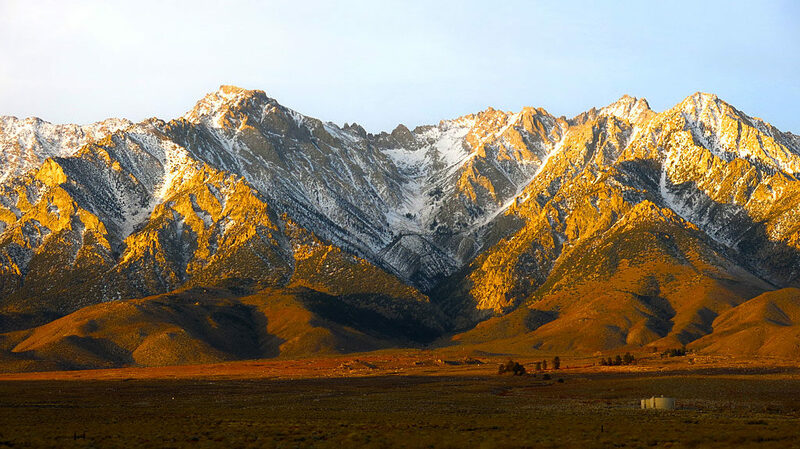 Nine days to kill in the Eastern Sierra — what a great problem to have. 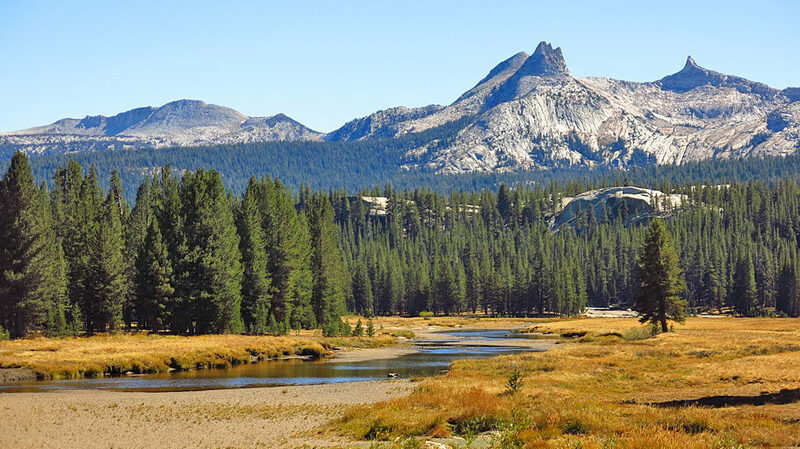 Of course there was the usual mountain biking, most likely relegated to Lower Rock Creek or other non-Mammoth Mountain locations. 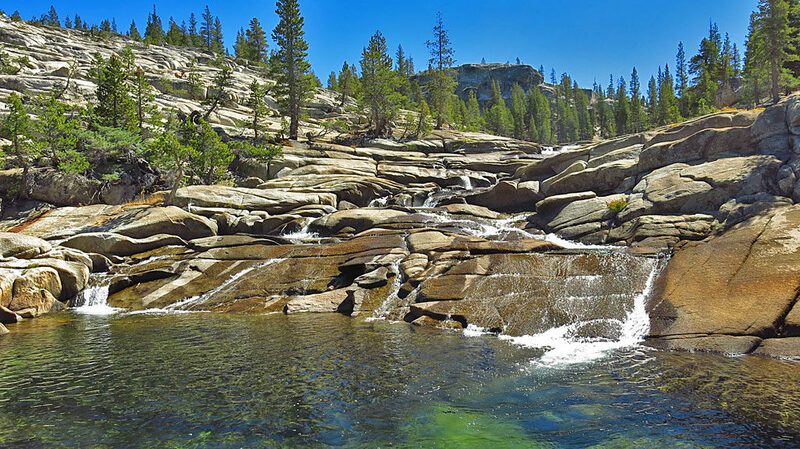 We wandered into the eastern side of Yosemite Park a couple days, and also hit a lot of other trails and creeks and lakes. 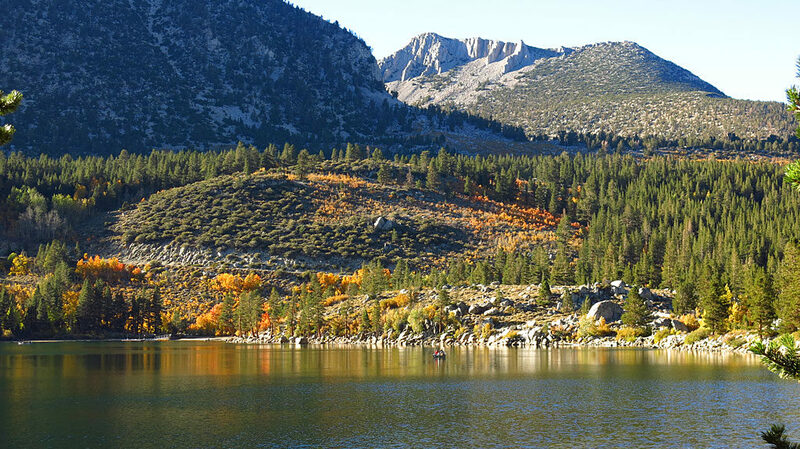 We made one unsuccessful trip to Laurel Lakes. As always, we got to see and experience lots of cool new things. 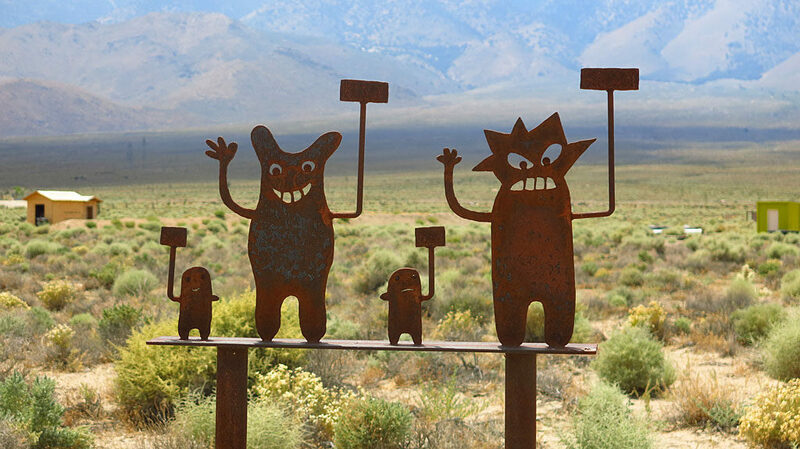 While driving north on CA-395, we stopped to see the Olancha Sculpture Garden — this piece apparently inspired by The Simpsons. 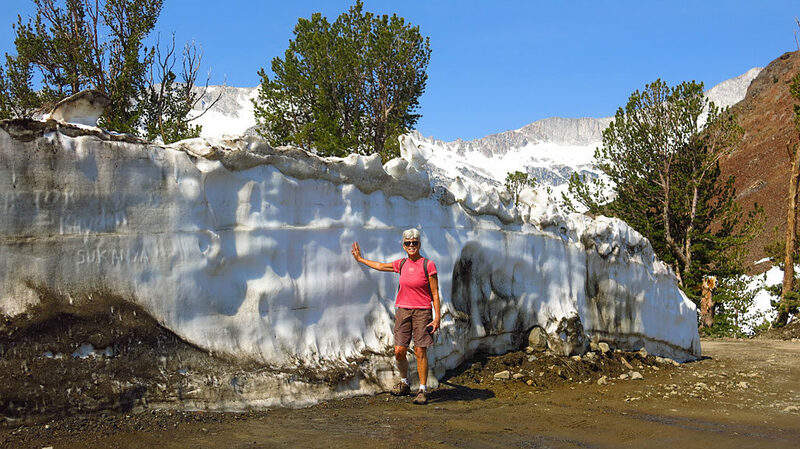 600 inches of winter snow in the Sierras translates to a ton of snow remaining in July. 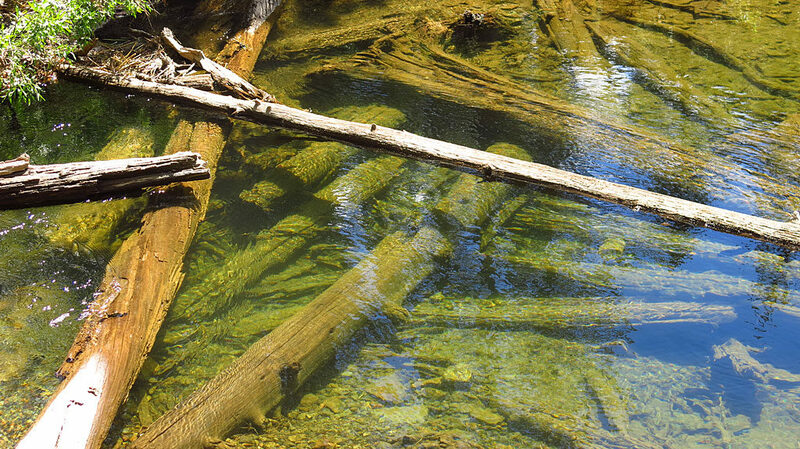 Creeks are flowing fast and full, and lakes crept into the forests. 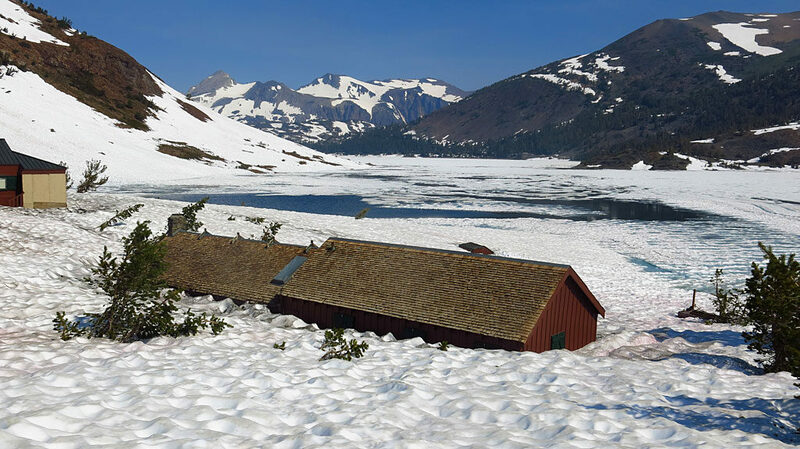 Saddlebag Resort was not open in July, and due to snow damage, would not be opening for the remainder of 2017. 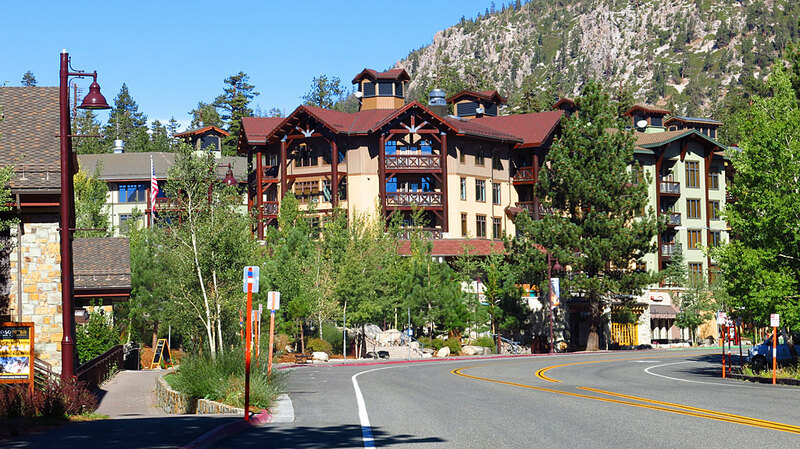 If you’re looking to purchase a resort in the high Sierras, this one is for sale. 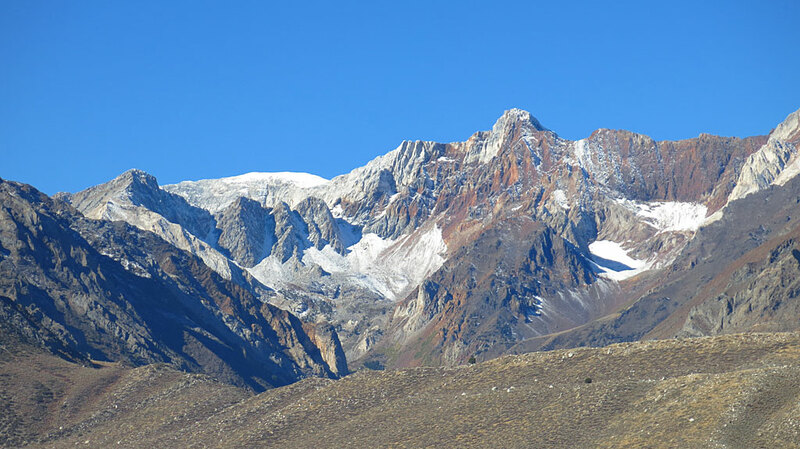 In the background is mostly-frozen Saddlebag Lake. 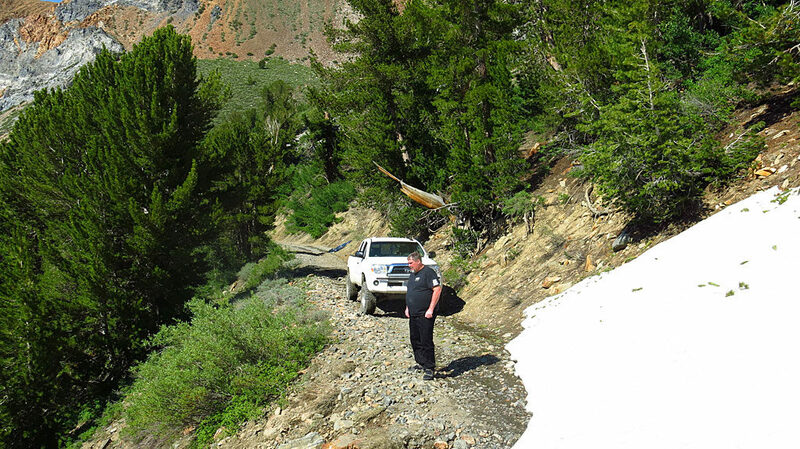 Non-plowed snow at the side of the road at Saddlebag Lake. 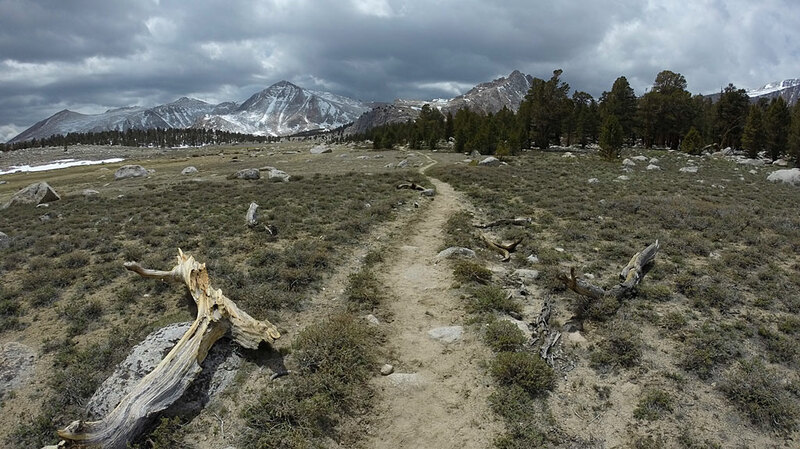 A photo sphere above Saddlebag Lake. Watch for pinkish Watermelon Snow. 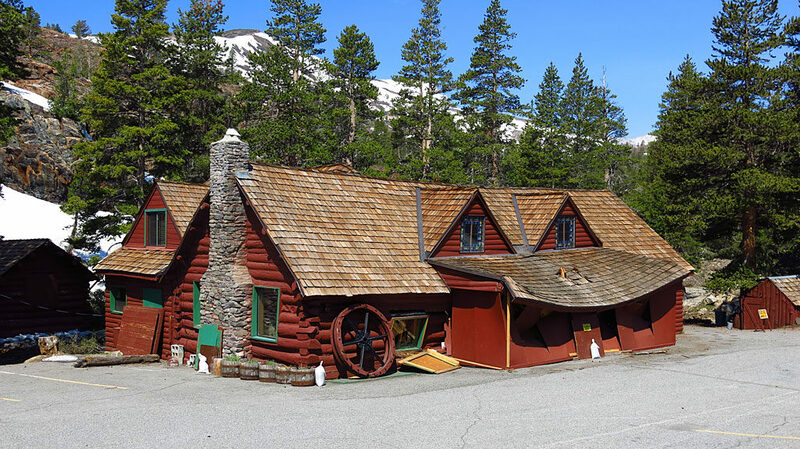 And speaking of snow damage, the Tioga Pass Resort is also not opening for the season. Many cabins near the creek were still flooded. 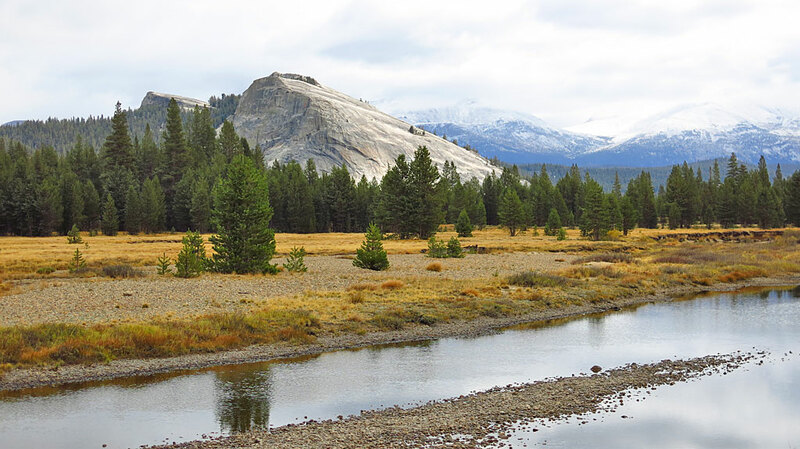 The Tuolumne River flows through Tuolumne Meadows in eastern Yosemite. 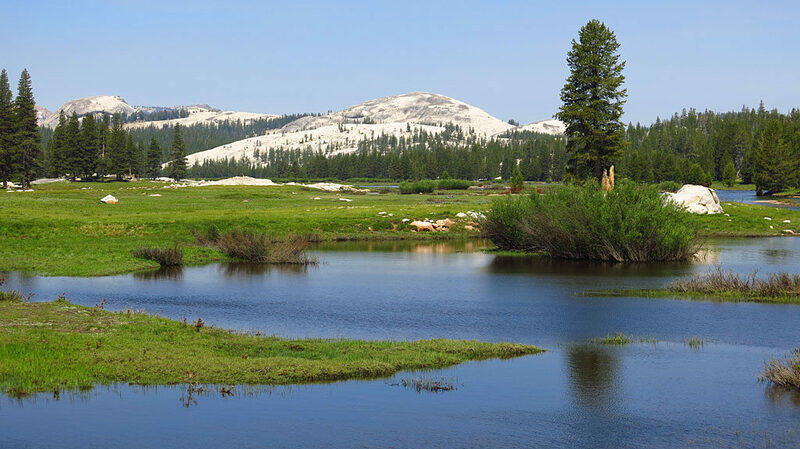 Much of the meadow is flooded. 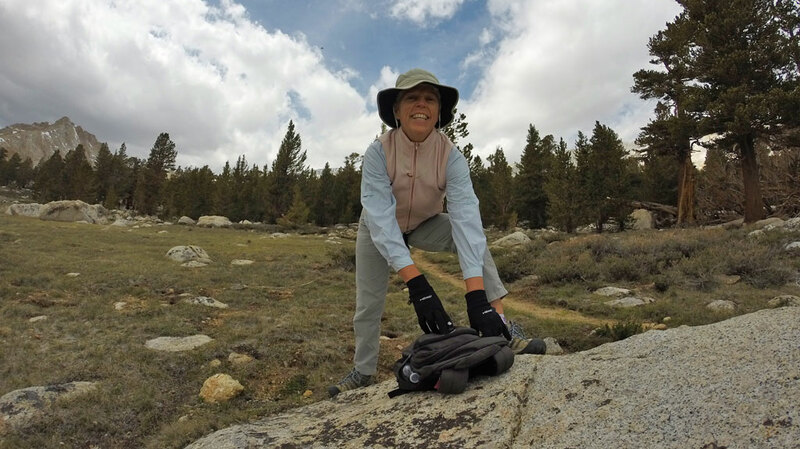 Carol and I hiked a short section of the John Mu Trail in Tuolumne Meadows. 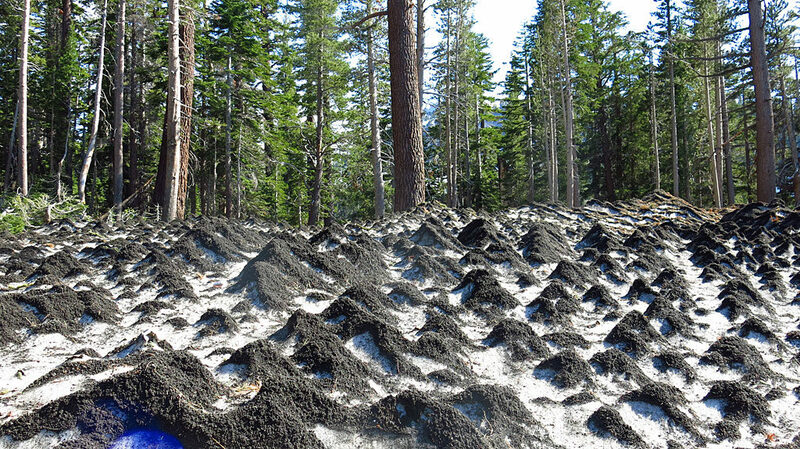 Suncups near the base of Mammoth Mountain Resort topped with road cinders. 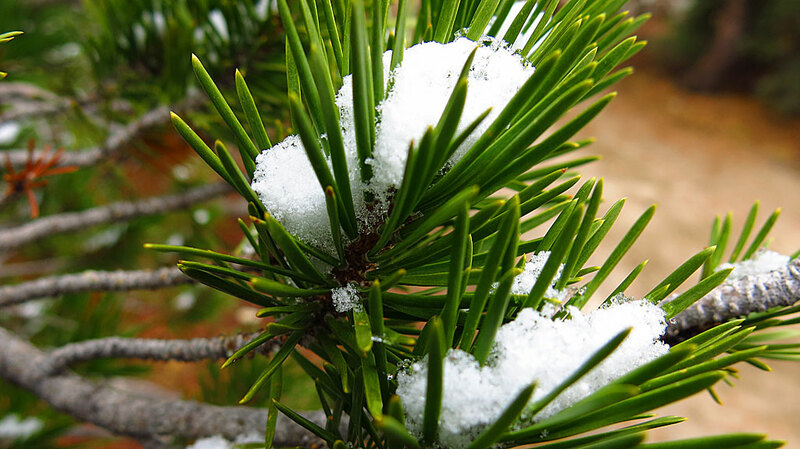 Suncups form during the ablation of snowy surfaces. The top of Mammoth Mountain in July — the smokey skies in the background are the result of burning wildfires on the western side of the Sierras. 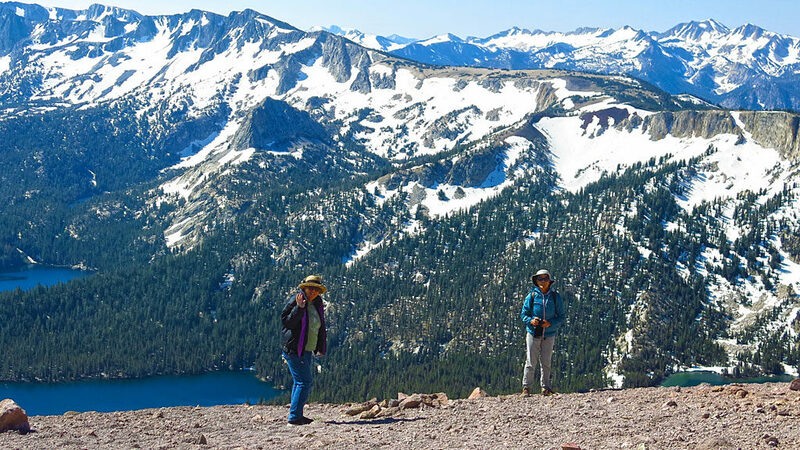 Jan and Carol look at distant lakes from the top of Mammoth Mountain. 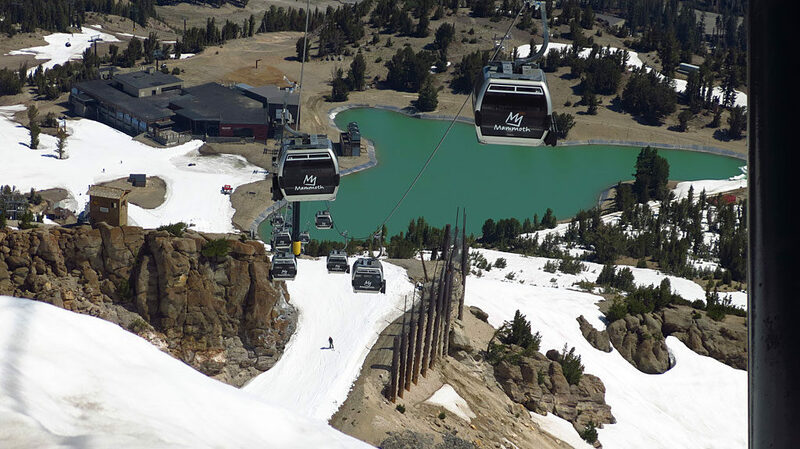 Mammoth is planning to be open for skiing and snowboarding through mid-August. 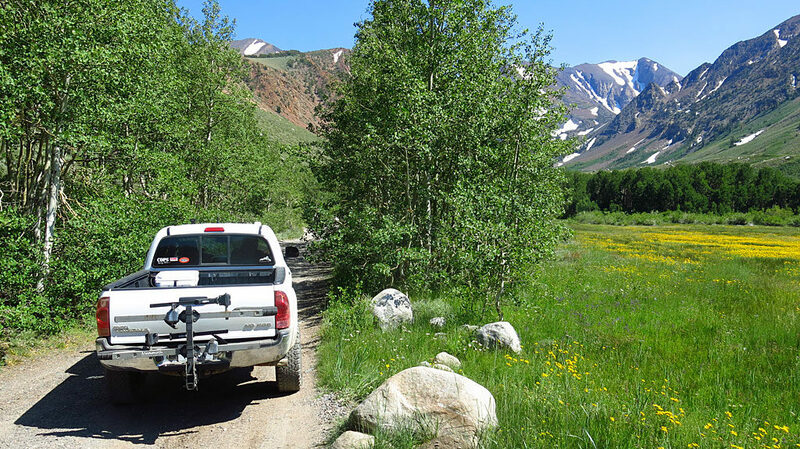 Not so good for us mountain bikers — our only riding options were the baby trails at the bottom of the mountain — not worth a day’s lift pass. 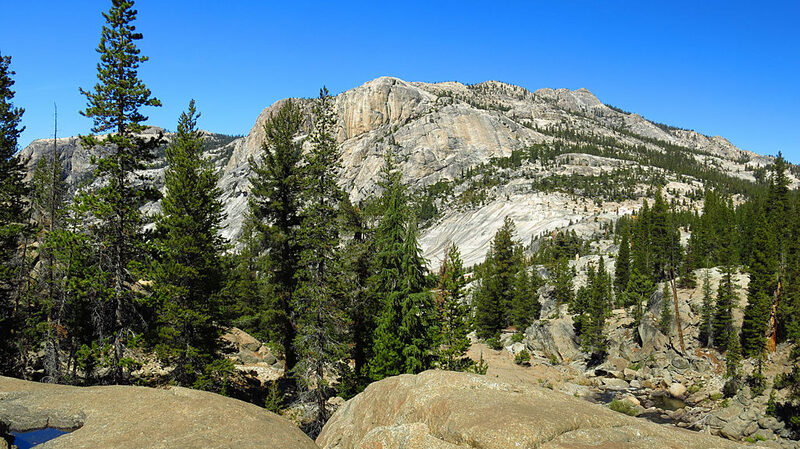 Back in Yosemite again — this time on top of Pothole Dome, an easy hike with spectacular 360º views. 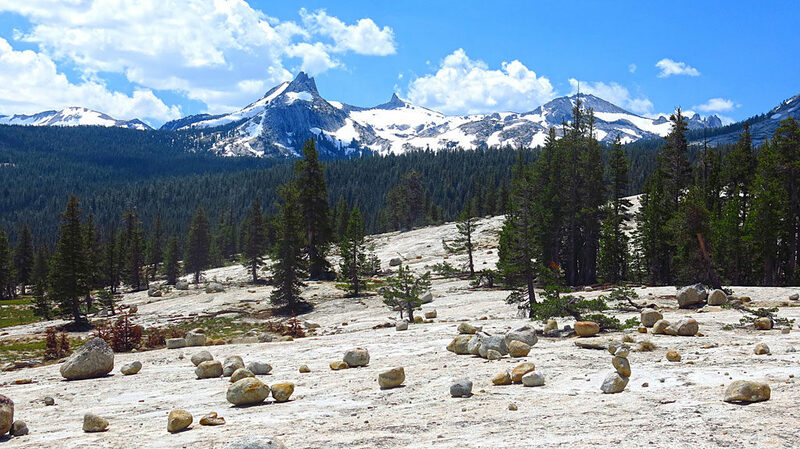 Rocks on the top of Pothole Dome left behind from receding glaciers 20-30 years ago. 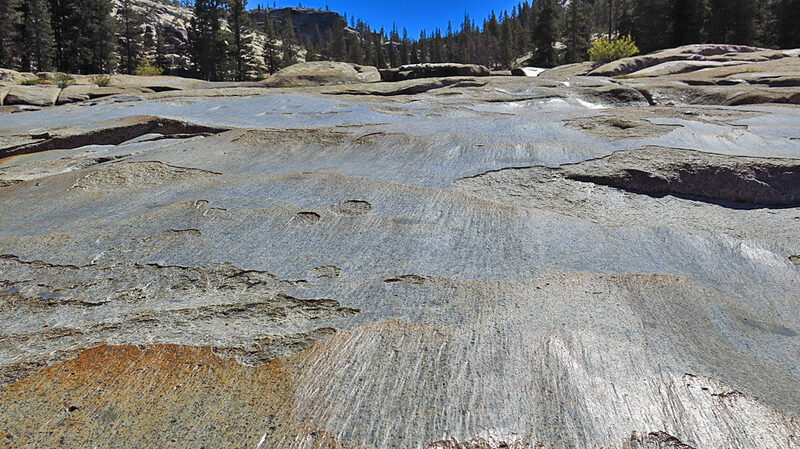 The Tuolumne River experiencing a heavy flow this time of the year. 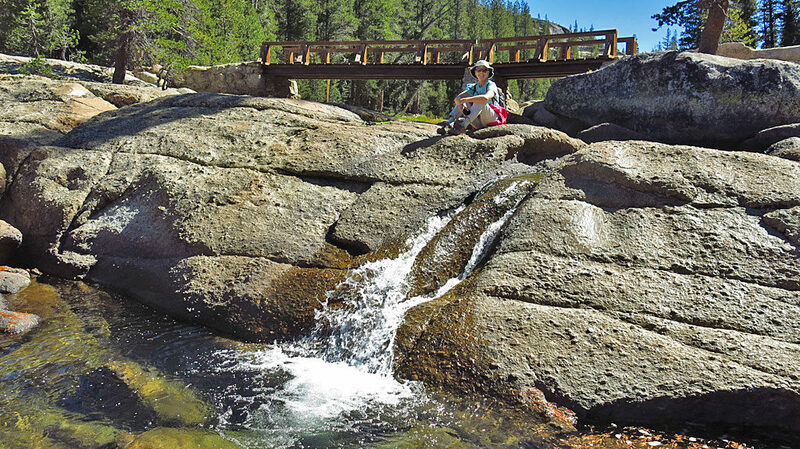 Lots of clear water flowing into Virginia Lakes — let’s celebrate by turning on our garden hoses! 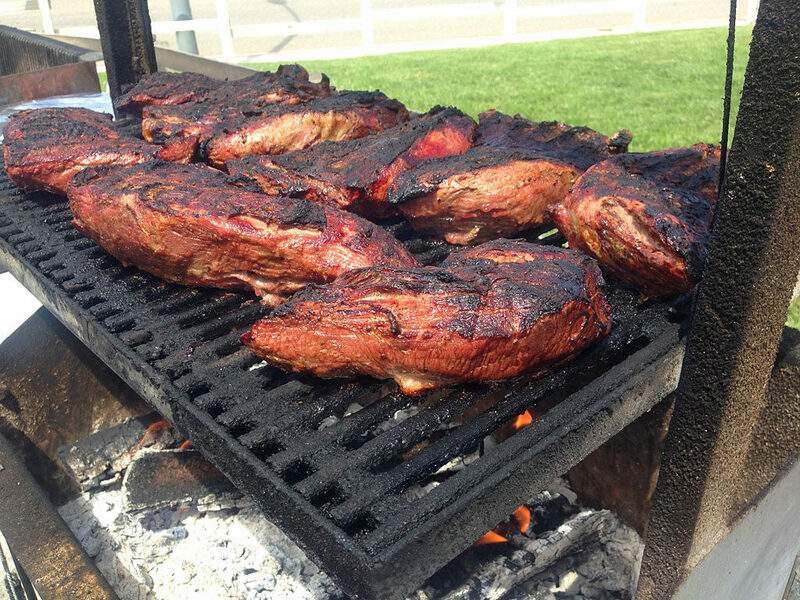 Any more, it’s become a tradition to stop at the Copper Top BBQ in Big Pine. Awesome BBQ and even better BBQ sauce. Sorry foodies, no kale or tofu or keen-wah here. 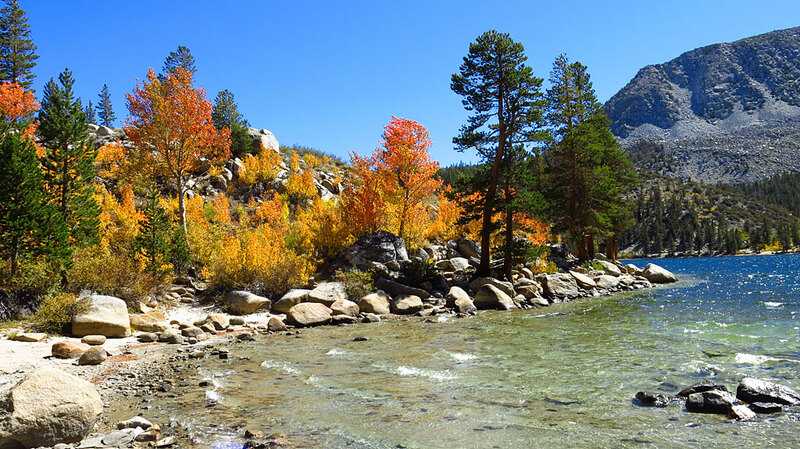 Aspens changing color at 9,000′ in Tioga Pass near the east entrance to Yosemite National Park. Rock Creek both fills and drains Rock Creek Lake. 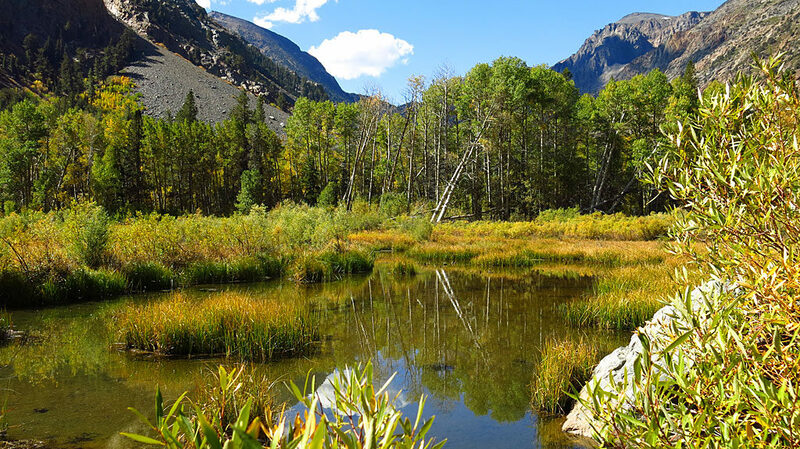 Aspens and pines line Rock Creek Lake. 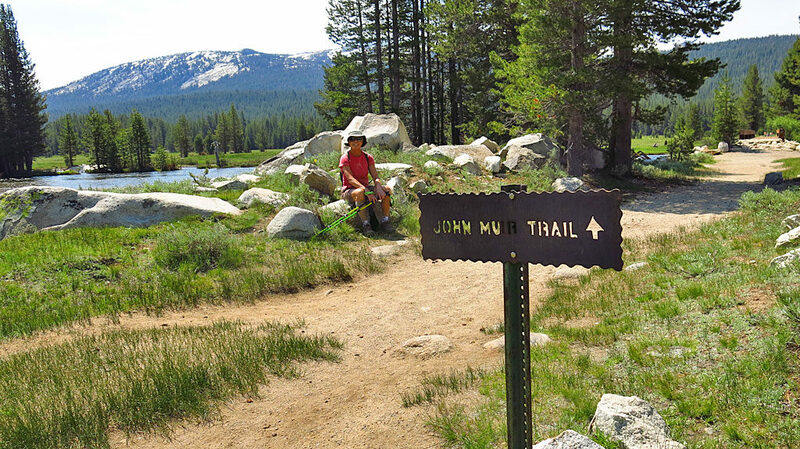 The trail to Lake Dorothy. 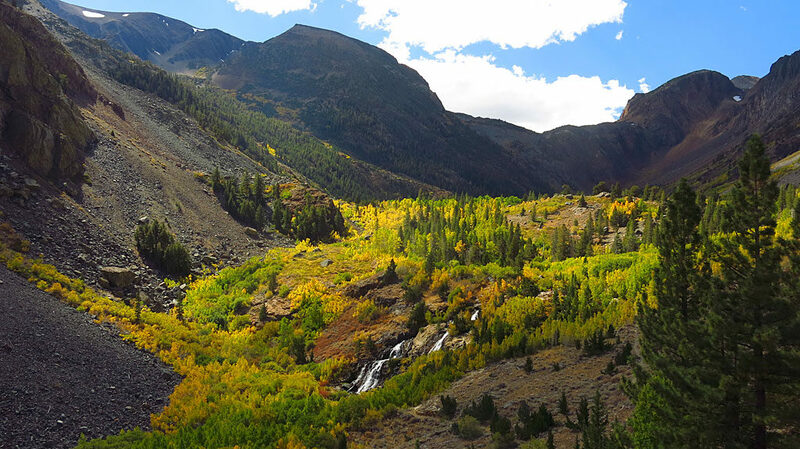 The best fall colors were over 9,000′ elevation, but slowly creeping down the mountain. Looking west across Rock Creek Lake. A beaver-dammed lake on Mill Creek. 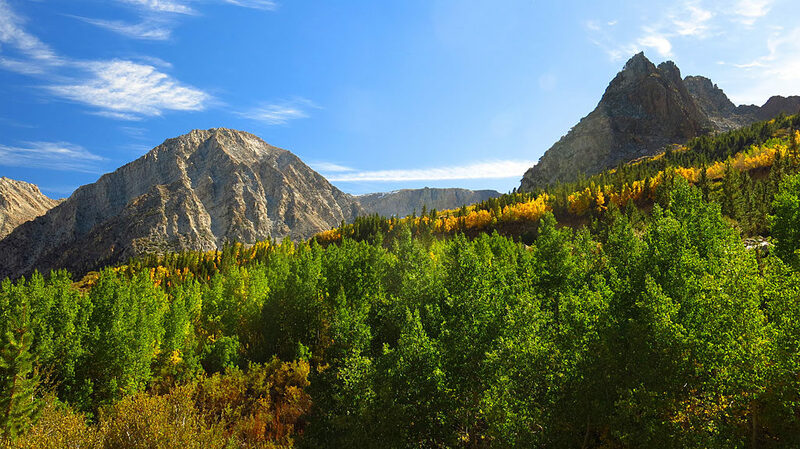 At only 8,000′, trees were just beginning to change color. 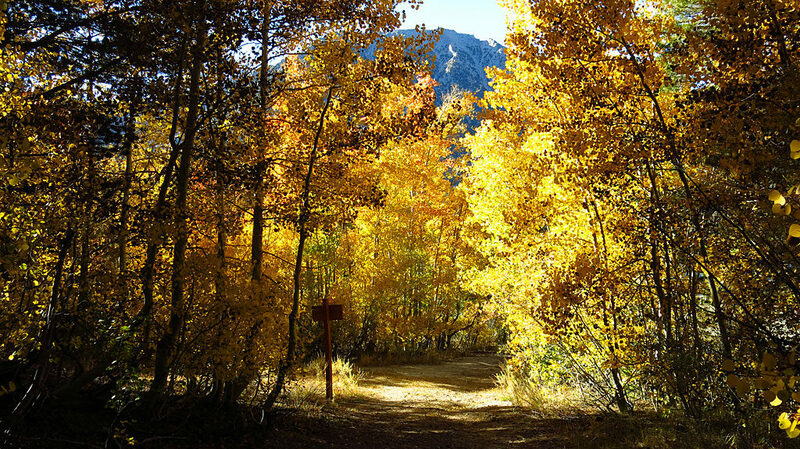 Fall color overload, approaching the top end of Lundy Canyon. 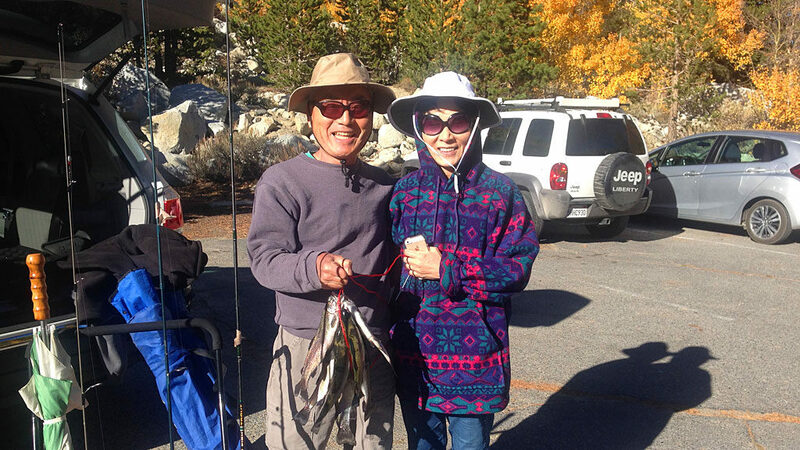 Happy campers with their limit of fresh trout — they never did tell us what time dinner would be served. 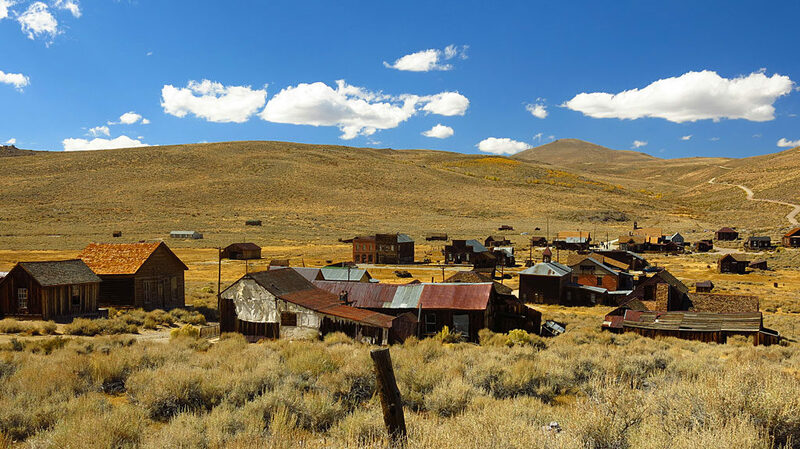 “Miners, gamblers and business continued to flood the area and by 1879, Bodie boasted a population of about 10,000 and 2,000 buildings. 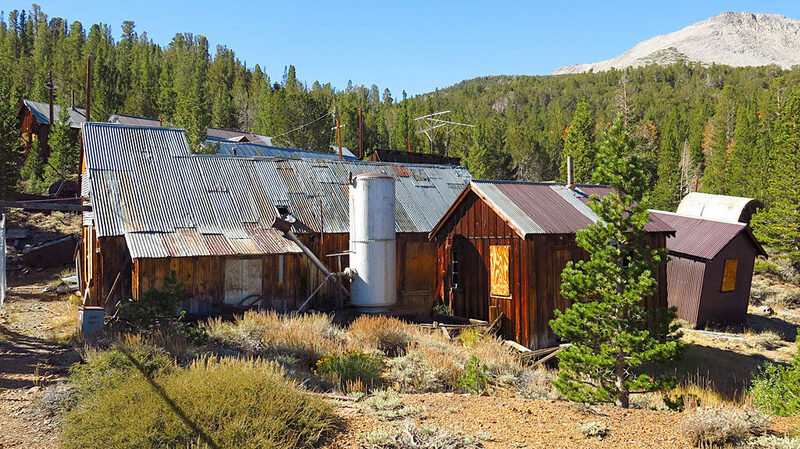 Before long the town supported some 30 gold mines, 65 saloons, numerous brothels, gambling halls, and opium dens, as well, as a number of legitimate businesses, including three newspapers, several churches, a couple of banks and a school. 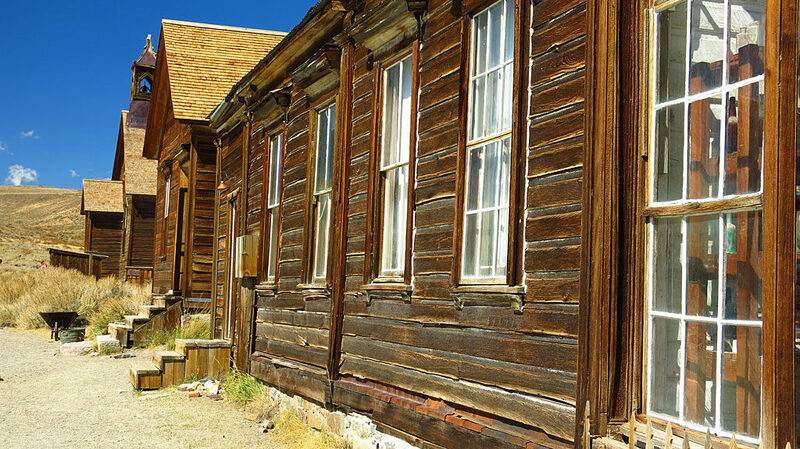 Every other building on the mile long main street was a saloon. 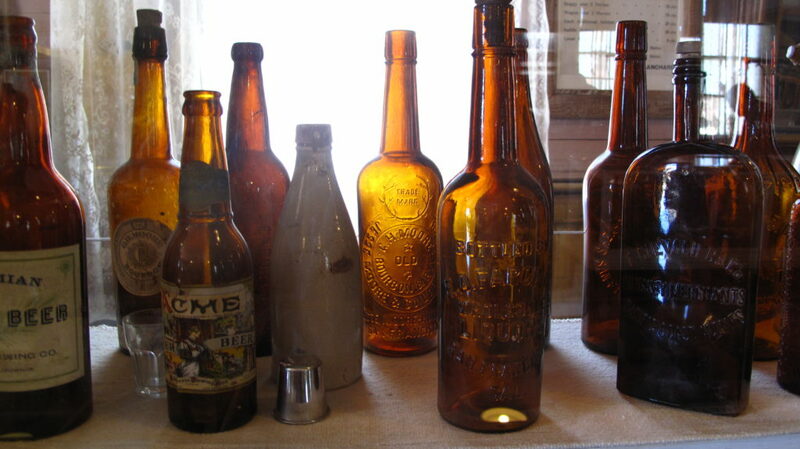 Three breweries worked day and night, while whiskey was brought into town in 100 gallon barrels. 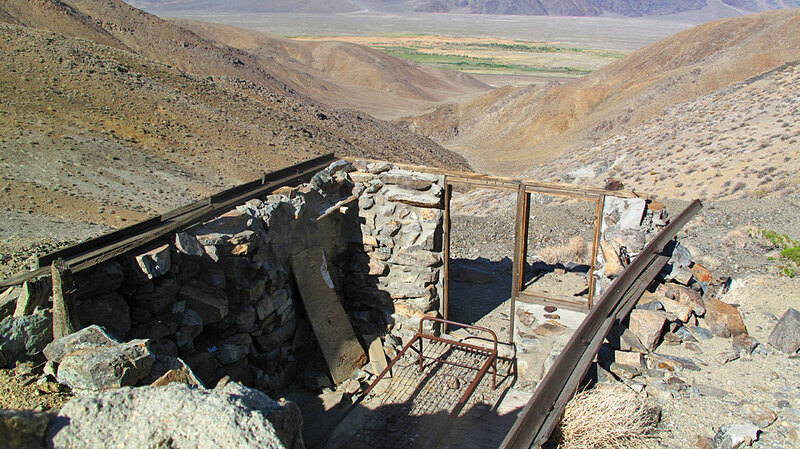 “Like many booming mining camps, Bodie soon earned a reputation for violence and lawlessness. Killings were sometimes daily events and robberies, stage holdups and street fights were common occurrences in the camp. 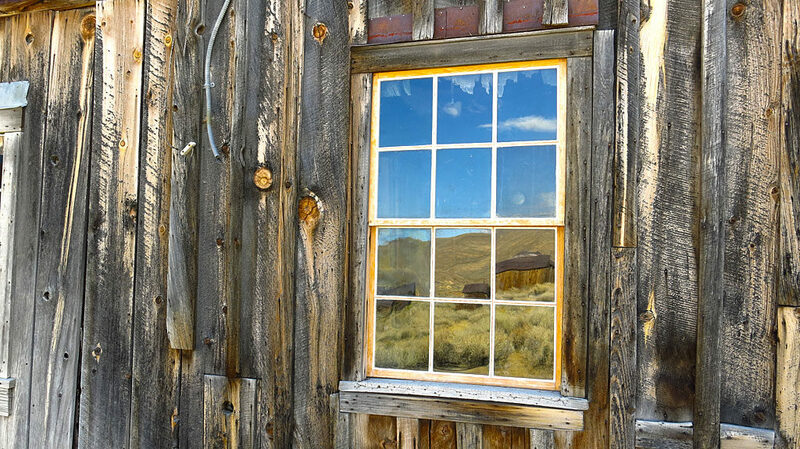 Bodie has around 110 buildings remaining from a boom of 2,000 buildings in the late 1880s. 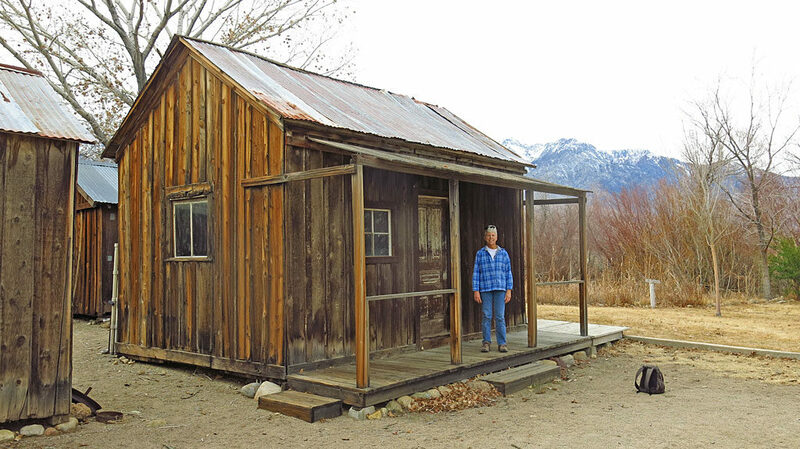 On June 23, 1932, the second of two major fires destroyed more of the town, leaving what remains today. 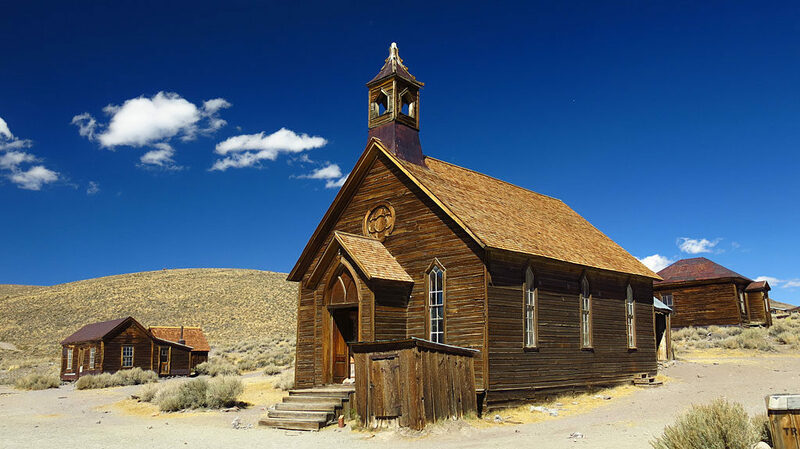 The iconic Bodie Methodist Church — its first service was on September 15, 1882. Looking west down Green St., from the J.S. Cain residence on the right, to the Methodist Church. 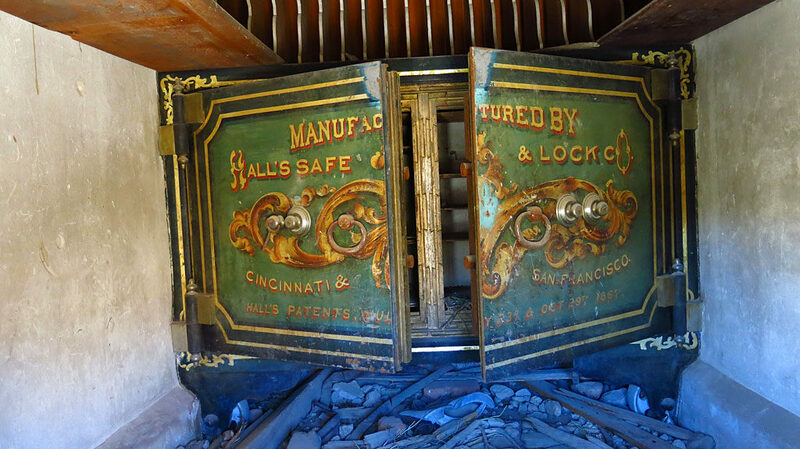 A vault inside the Bodie Bank: “Manufactured by Hall’s Safe and Lock Co., Cincinnati and San Francisco, Hall’s patents July 23 and Oct. 29, 1867.” The bank had gone untouched by the 1892 fire, but wasn’t so lucky in the 1932 fire. 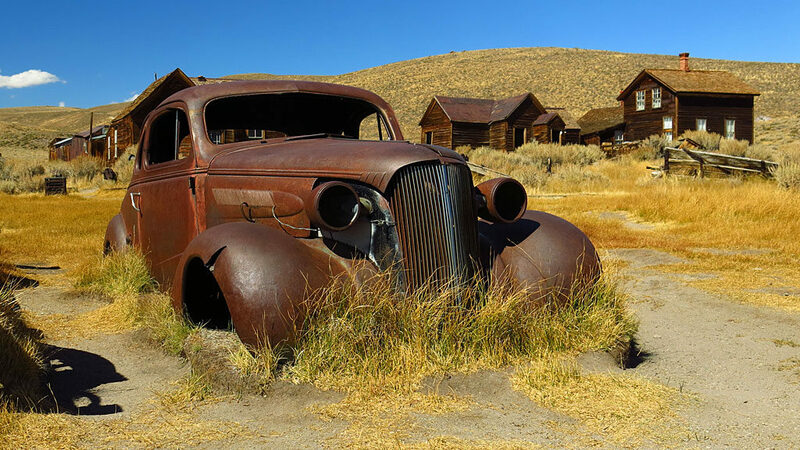 The Moyle Brothers Warehouse was located just north of the bank, on Main St.
A 1937 Chevrolet coupe is one of the many long-time residents of Bodie. 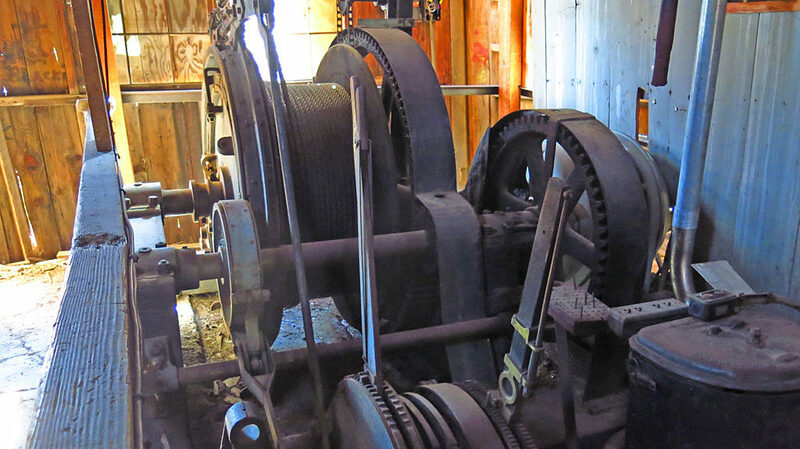 Bodie was remote, materials were in high demand, and nothing could be wasted. 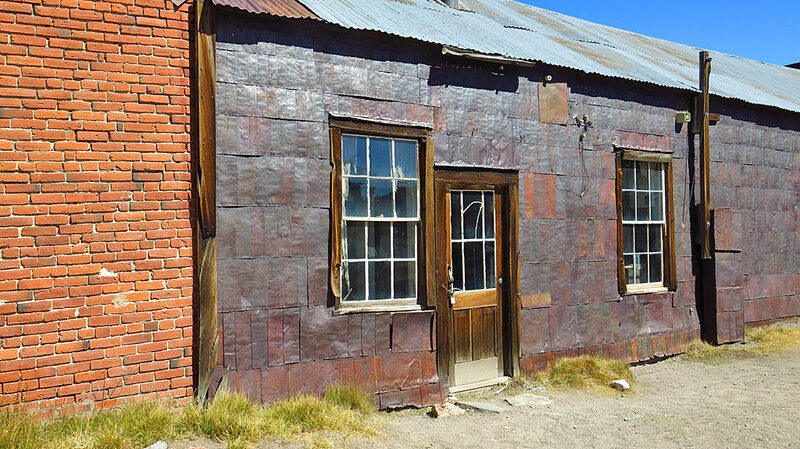 Once empty, tin cans were cut open, flattened and used as building siding, or to seal a leaking roof. 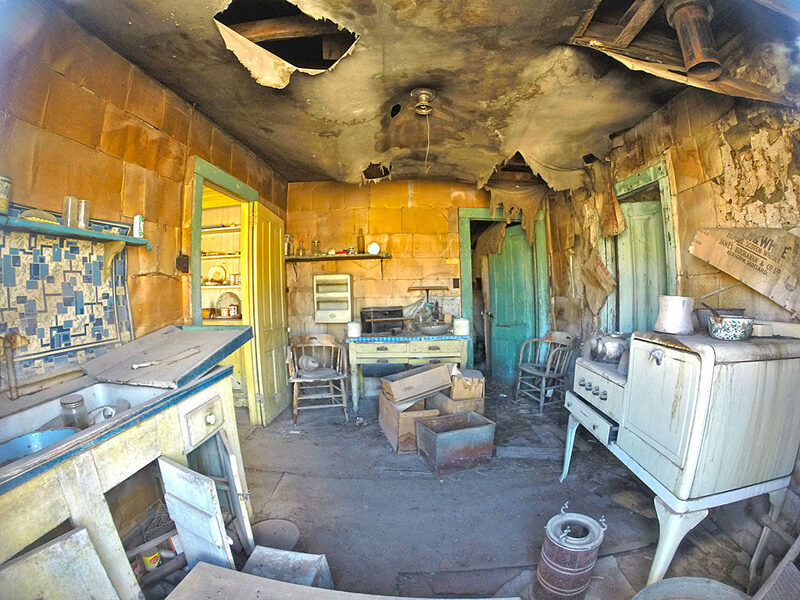 A residential kitchen. Wallpaper seemed to be popular in town. Carol peeks inside Dr. Street’s house on Green St. The building in the background with the bell tower is the school. 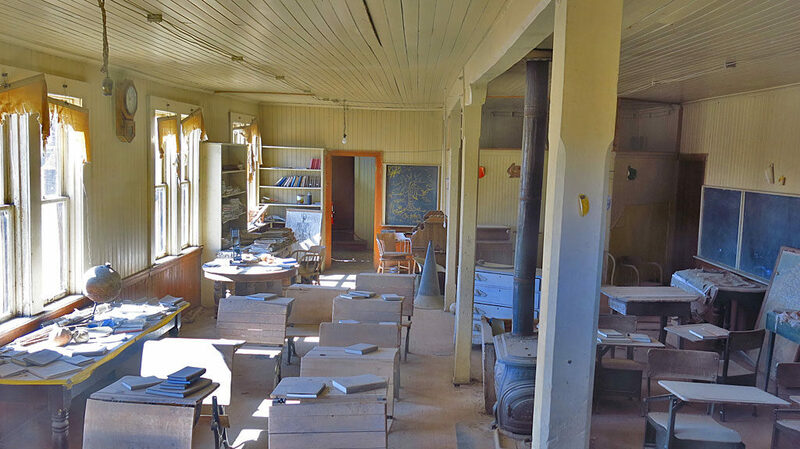 A ground floor school room in the two-story school house. 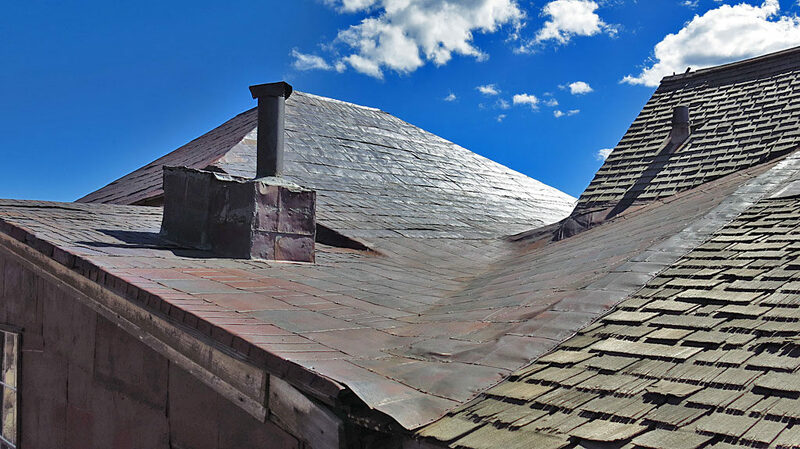 Empty tin cans converted into roofing material — most likely, a hot tin roof. The firebox for an air compressor boiler. 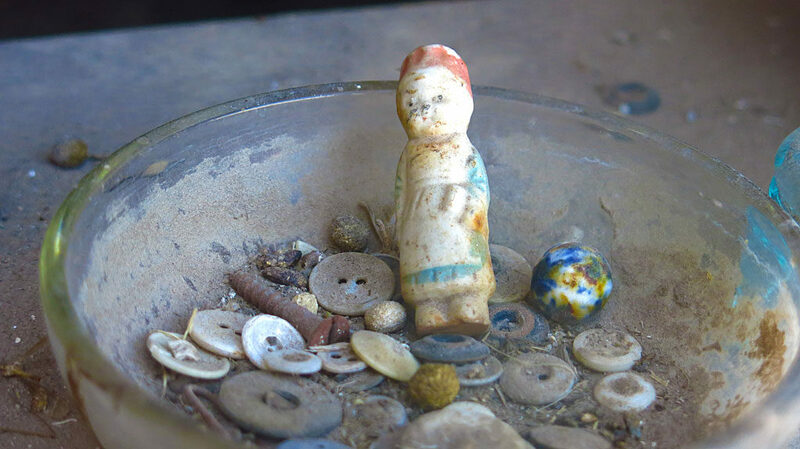 A child’s toy inside one of the homes. 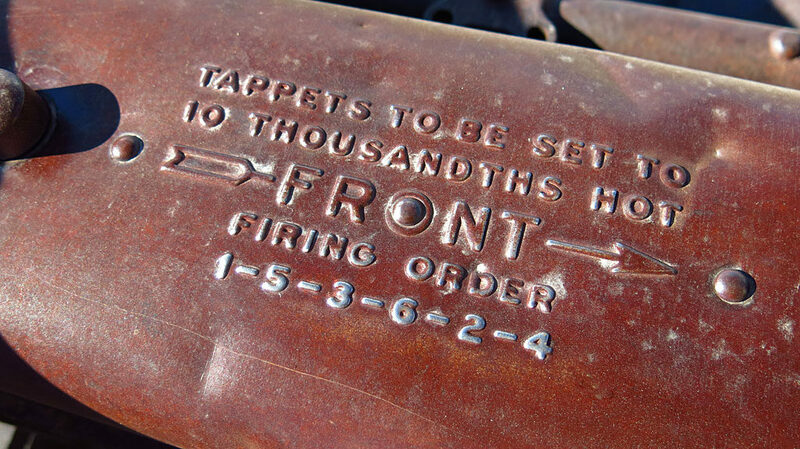 Maintenance instructions on an old Ford’s valve cover. Weathered wood with artsy-farty reflectorizing. 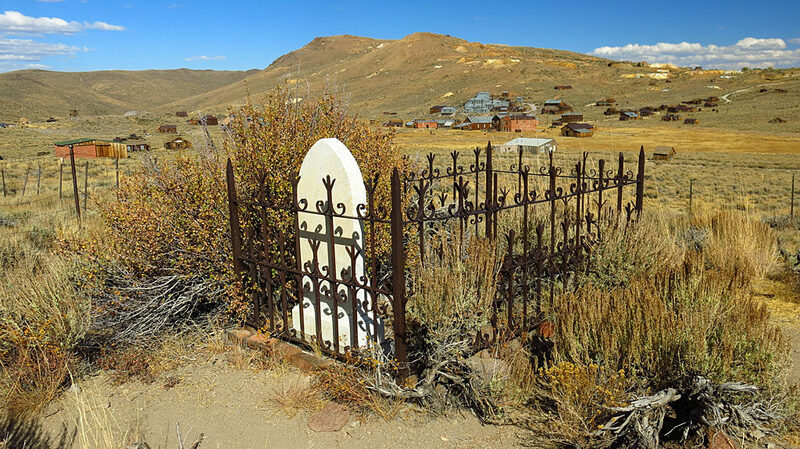 The McDonell family plot in the Bodie graveyard. 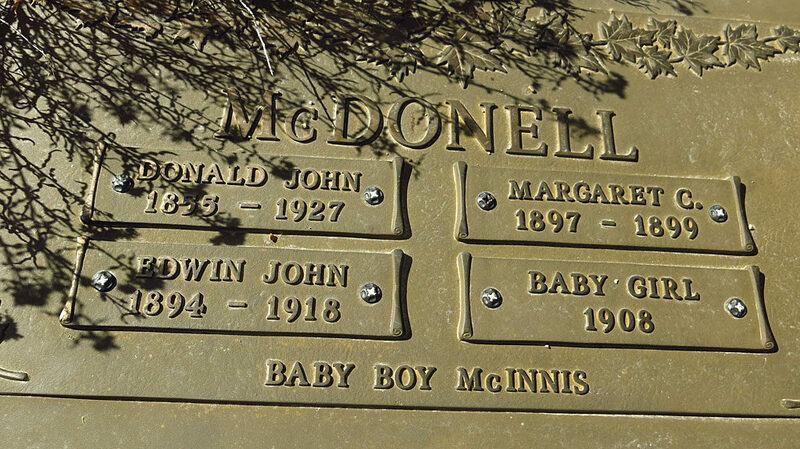 Scallywags and ne’er-do-wells were buried outside the town’s cemetery. Chinese residents were laid to rest in a separate cemetery. 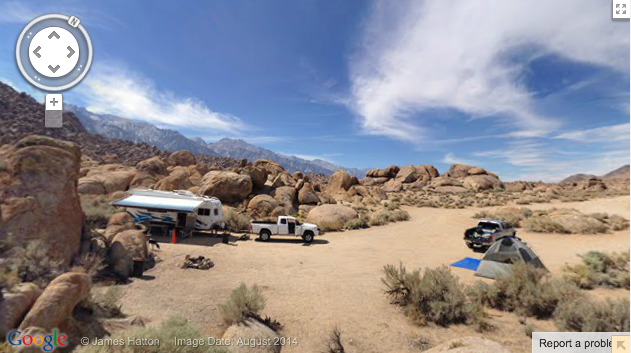 Memorial Day weekend in the Alabama Hills on the eastern side of the Sierras. And nowhere near Alabama. I’d call that a stout win-win. 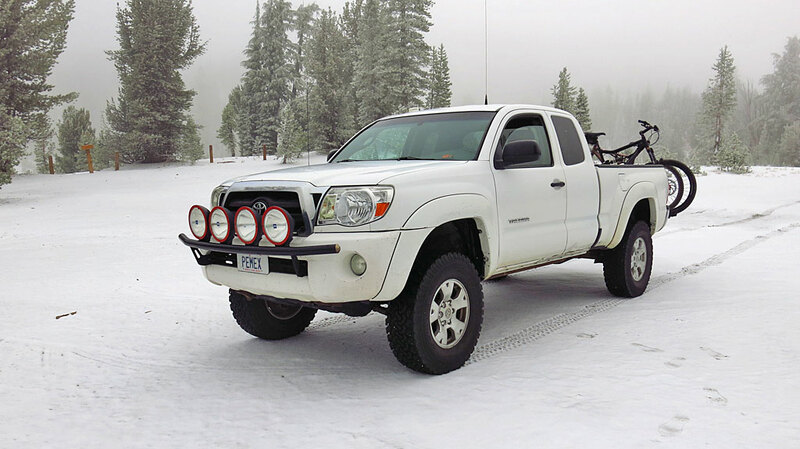 Rain at our elevation meant snow in the Sierras starting at 5,000 feet above us. Sunday morning, the day before Memorial Day. 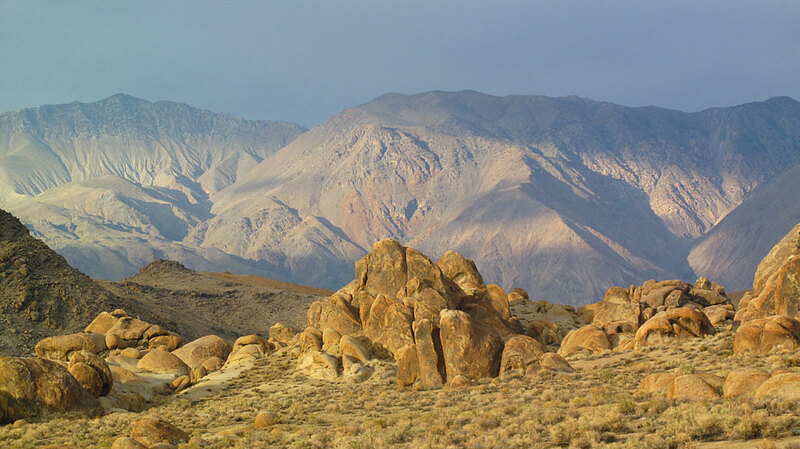 An overview of the Alabama Hills from Cocktail Point. Lone Pine Creek runs thru the green patch in the middle/left of the photo. 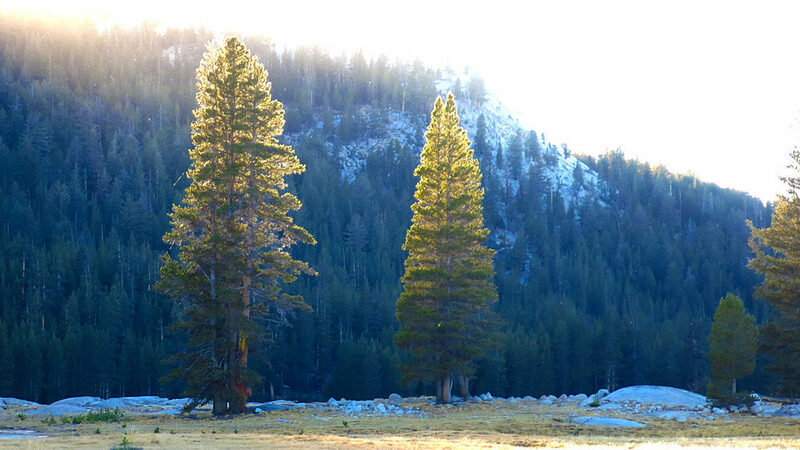 Late afternoon sunlight, before it disappears behind the Sierras to the west. 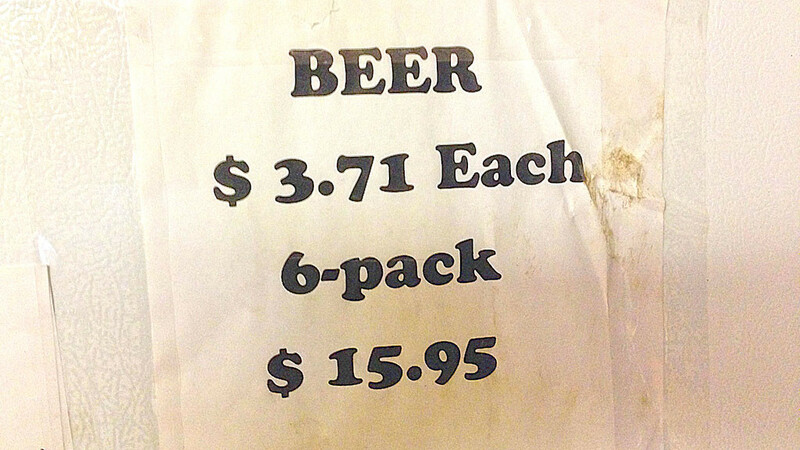 The cost of beer at the Whitney Portal Store — worth every nickle. 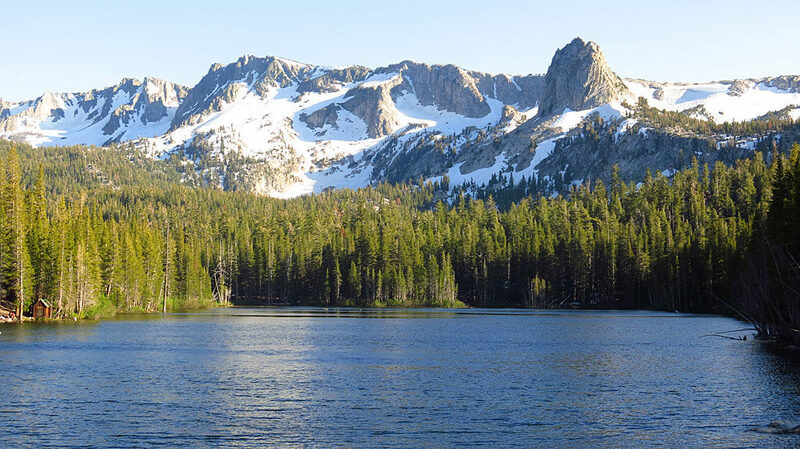 Two back-to-back weekends in the Eastern Sierras, with base camp at Mammoth Lakes. 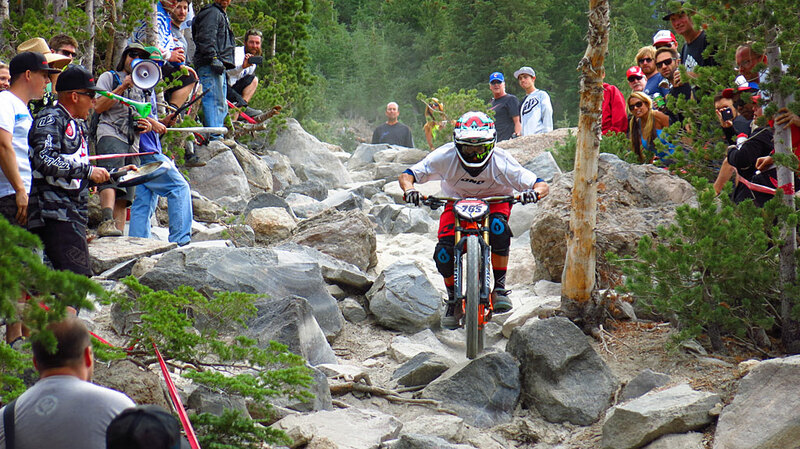 The purpose of the first weekend was to attend the 2014 Kamikaze Mountain Bike Games, which were fast and fun and furious. 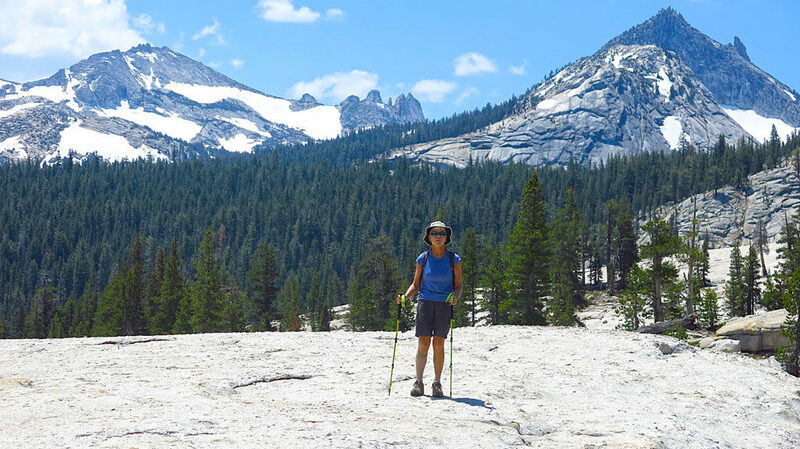 The second weekend included riding Lower Rock Creek, Rock Creek Lake, Tom’s Place, and Saddlebag Lake; in Yosemite we hiked Mays Lake and Tuolumne Meadows on the east side of the Park. Men’s Pro Downhill at a nasty rock garden just below the top of Chair 16. As always, the photos don’t do justice to the speed or steepness of the trail, or the skill of the rider. The guy with the megaphone on the left was very, very “enthusiastic,” if you catch our drift. And while we’re at it, more cow bell! 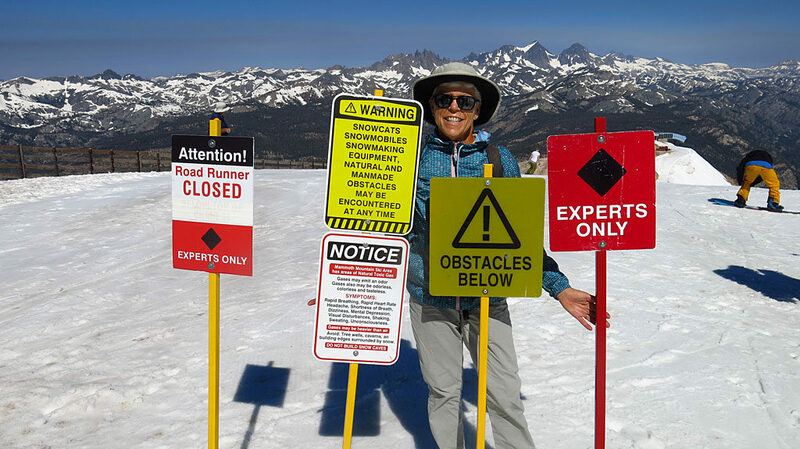 Dual downhill slalom at the Canyon Lodge at Mammoth Mountain. 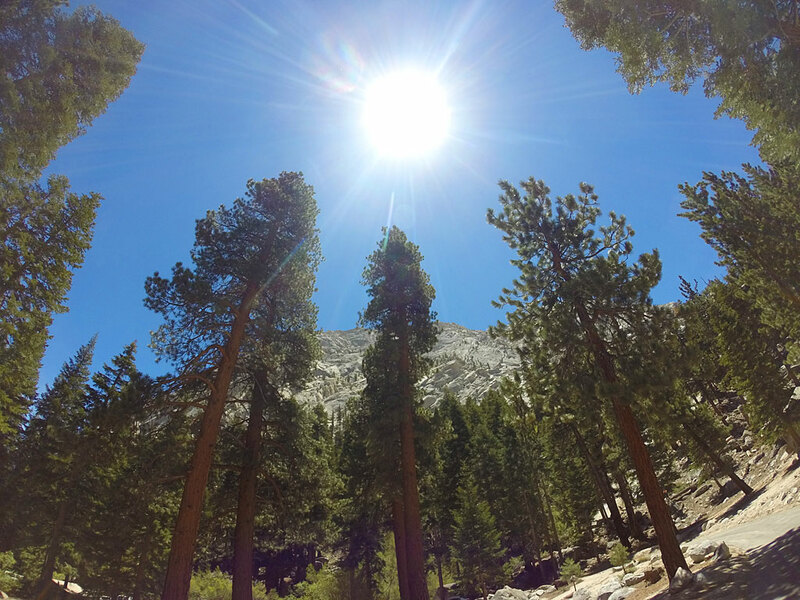 Grab and drag the photosphere to look around! Oh my Gawd, the guy with the red shirt doesn’t have any legs! 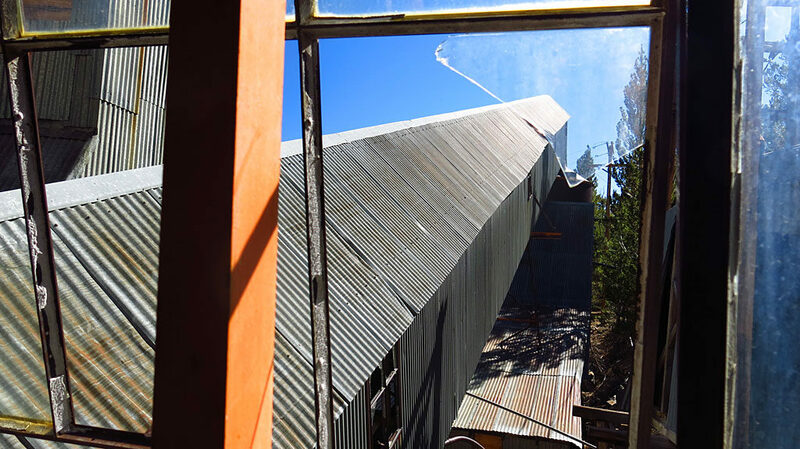 A photo sphere from the roof of the Canyon Lodge. 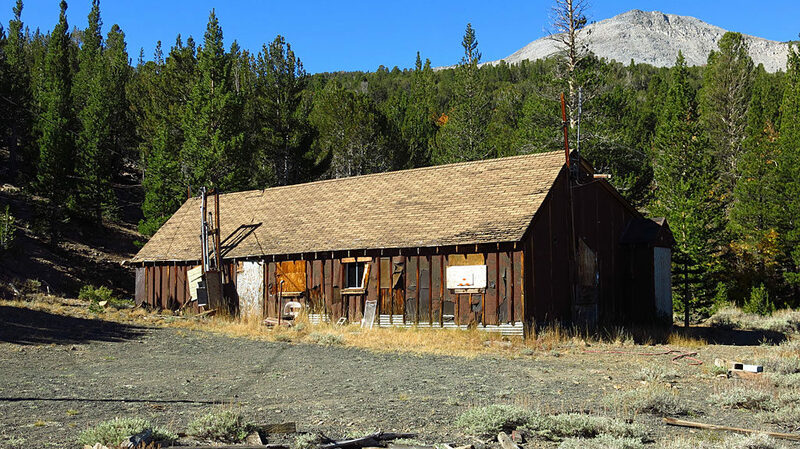 The Village in Mammoth Lakes was a ghost town after the mountain bikers left, and before the snow and skiers arrive. 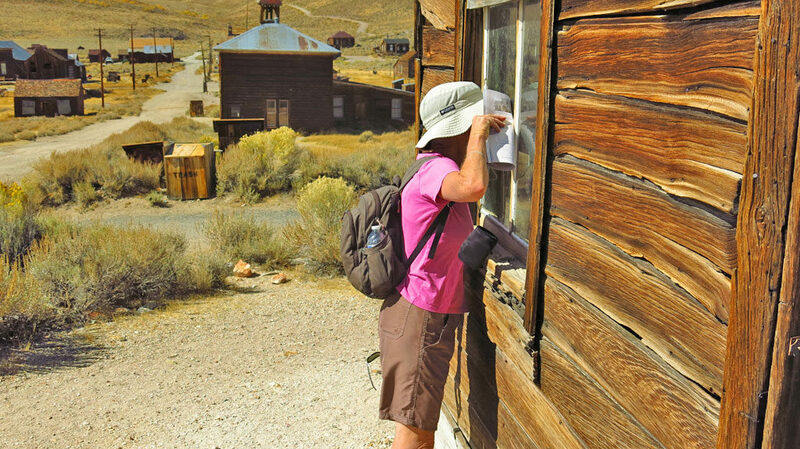 Many workers in town take advantage of the down-time to flee town. 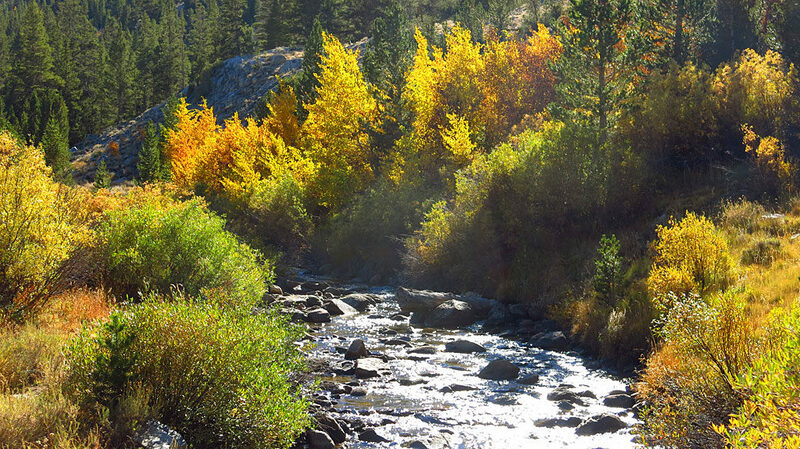 Autumn aspen colors at Rock Creek Lake. 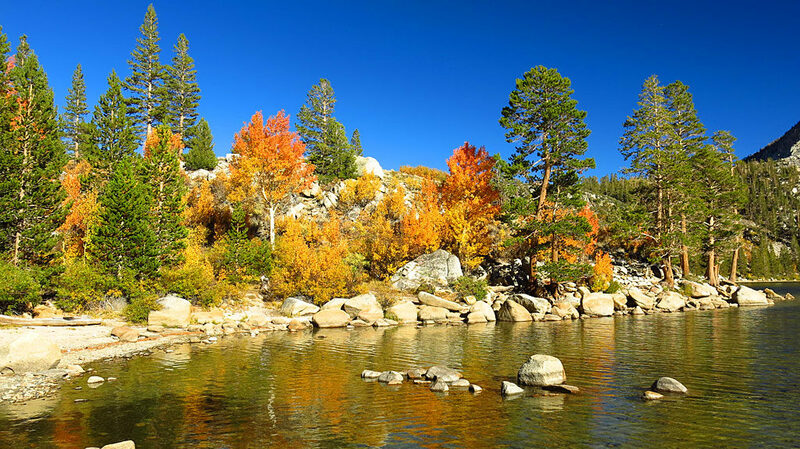 A photo sphere of autumn color from above Rock Creek Lake. Take a look around. 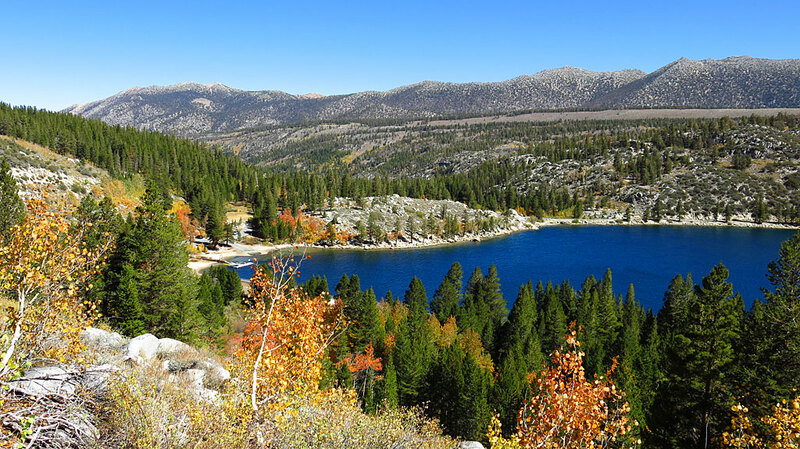 Rock Creek Lake from above; Wheeler Ridge in the background. 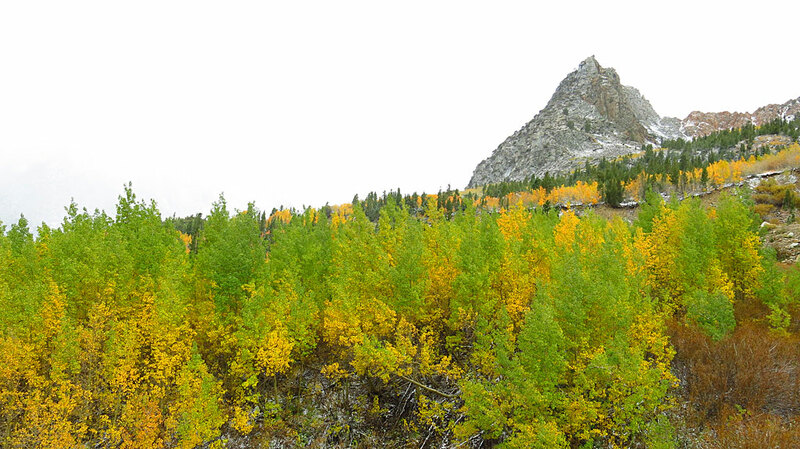 Changing aspens along Warren Fork on the Tioga Pass Road, on the eastern side of Yosemite (the Park, not the OS). 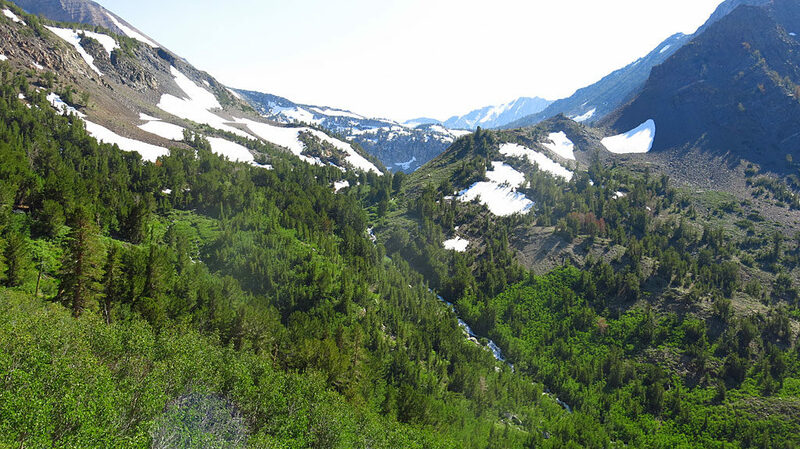 This day was “get into National Parks for FREE!” day, where The Man lets us stick it to him. 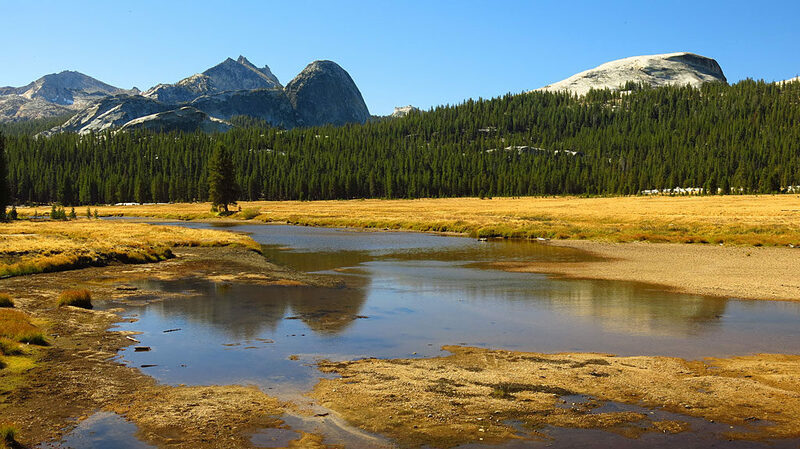 Lembert Dome in Tuolumne Meadows. 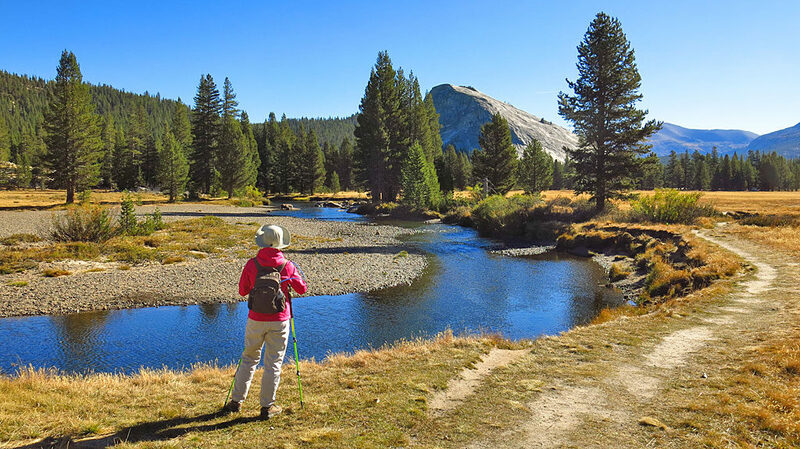 Carol stands in the middle of a low-flow Tuolumne River in Yosemite. 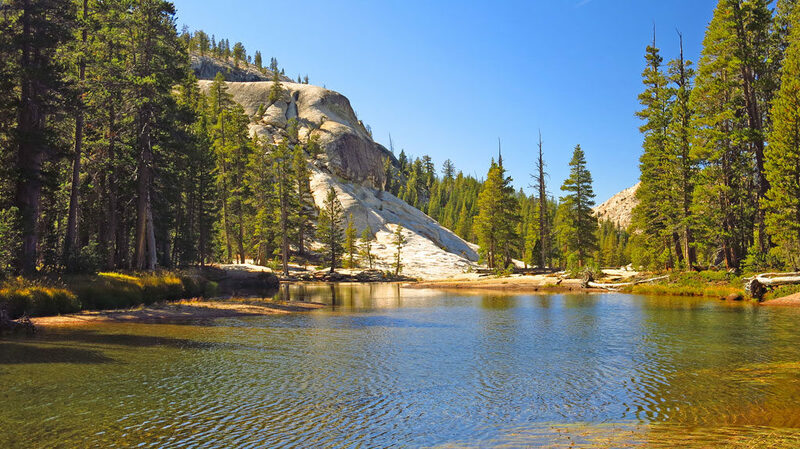 May Lake in Yosemite, around 9,200′ elevation. 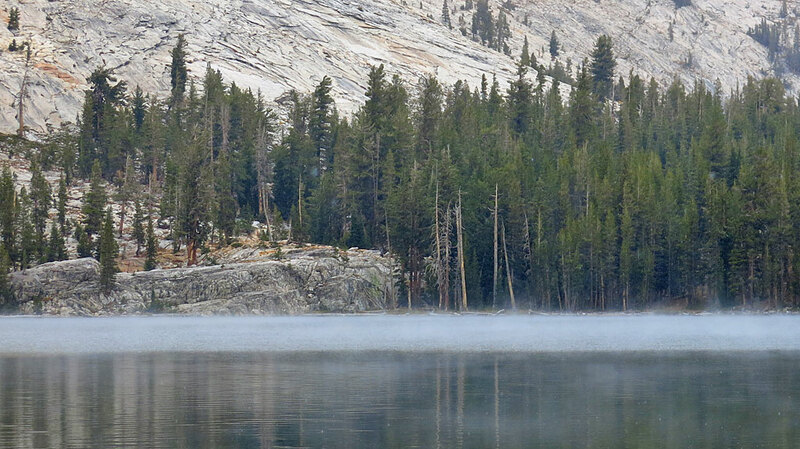 While we were hiking around May Lake, a 2′ thick layer of fog formed over one end of the lake, reminiscent of The Crawling Eye. 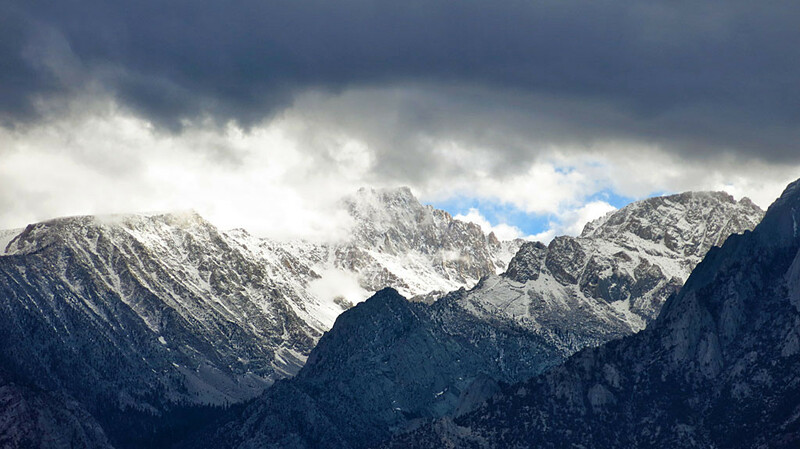 Snow arrives in the high country, delighting and amazing people from SoCal who never see the stuff. Dave McCoy’s hard work gets dusted. The parking lot at Red’s Lake. 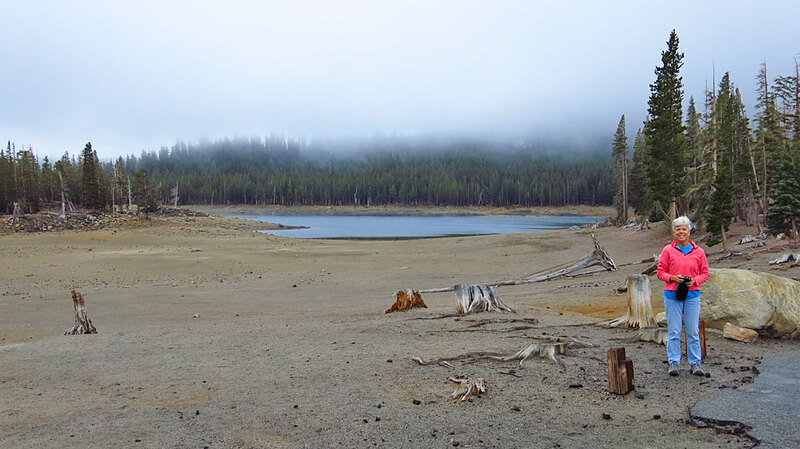 A very low water level at Horseshoe Lake – normally, the water would be just behind Carol. 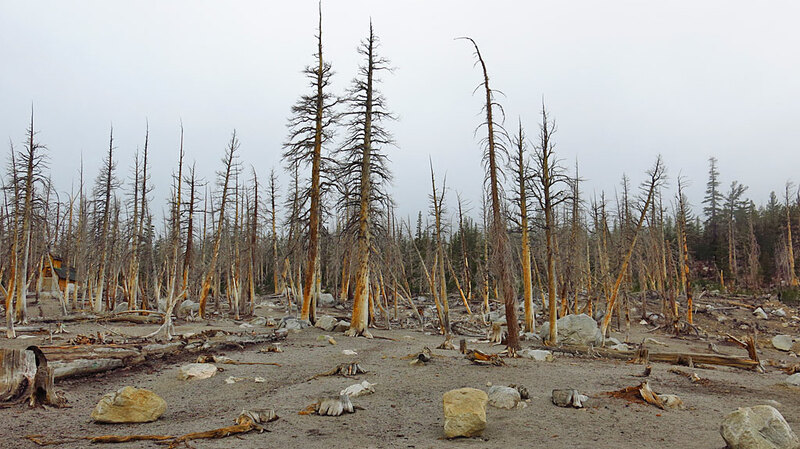 I’m here to report that the CO2 tree-kill area along the north shore of Horseshoe Lake is still dead. Soil gas in the tree-kill areas is composed of 20 to 90 percent CO2; there is less than 1 percent CO2 in soils outside tree-kill areas. 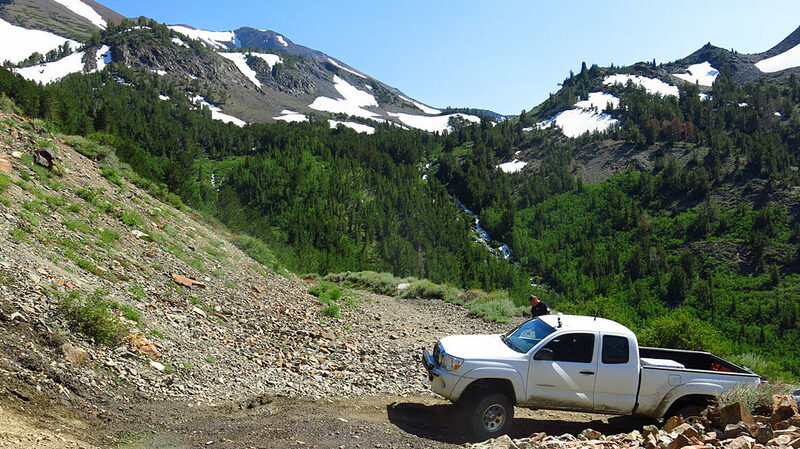 11,561′ Mt. Aggie right of center. 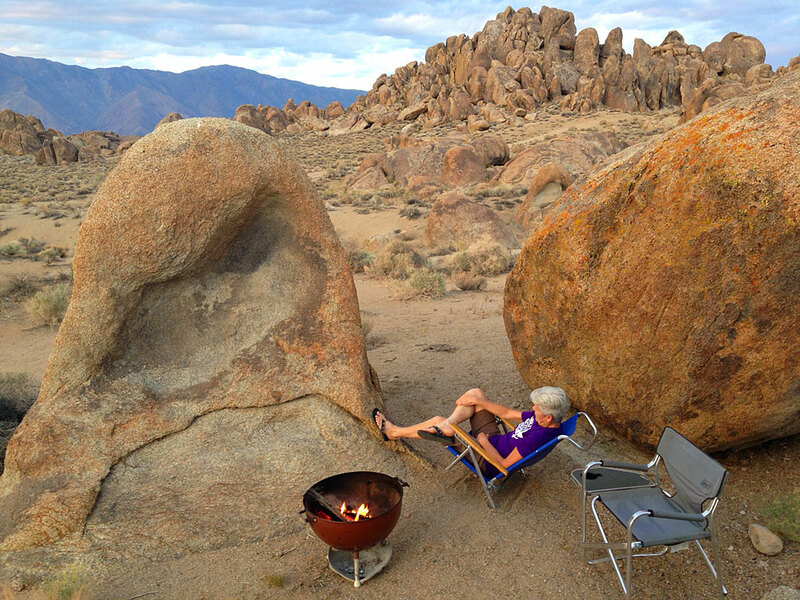 Breaking out of our regular routine, Carol and I decided to head to the Alabama Hills in the Eastern Sierras for Memorial Day weekend. 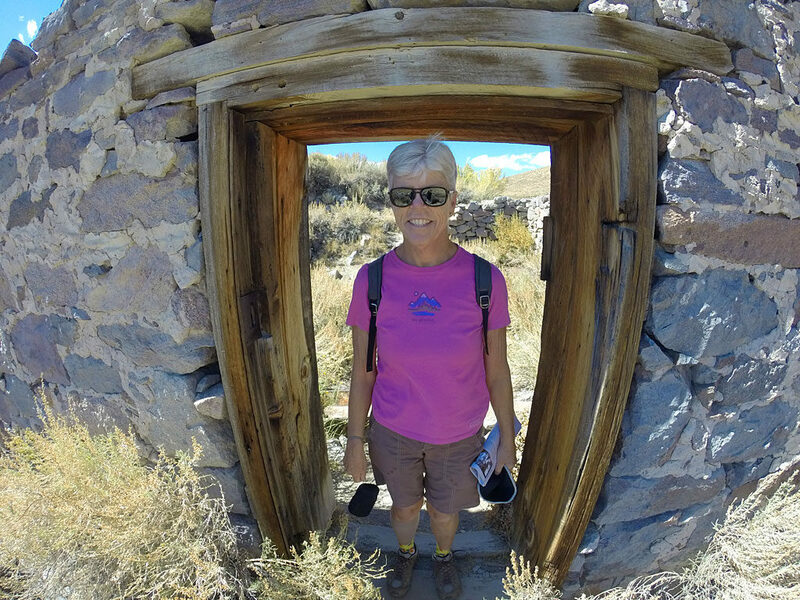 The plan was to base-camp in the rock hills, and wander and explore the area. Even though it was Memorial weekend, we were still able to hunker in and hide from the tourists. 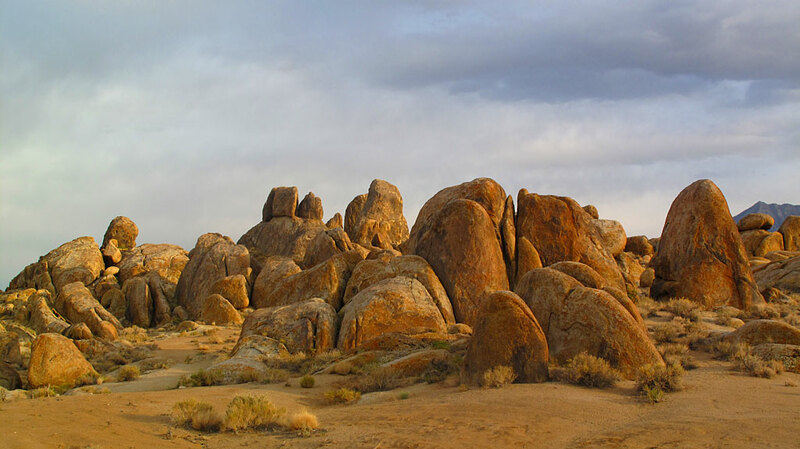 We arrived at our camp site about an hour before sunset, and were rewarded with views of some pretty impressive rocks. 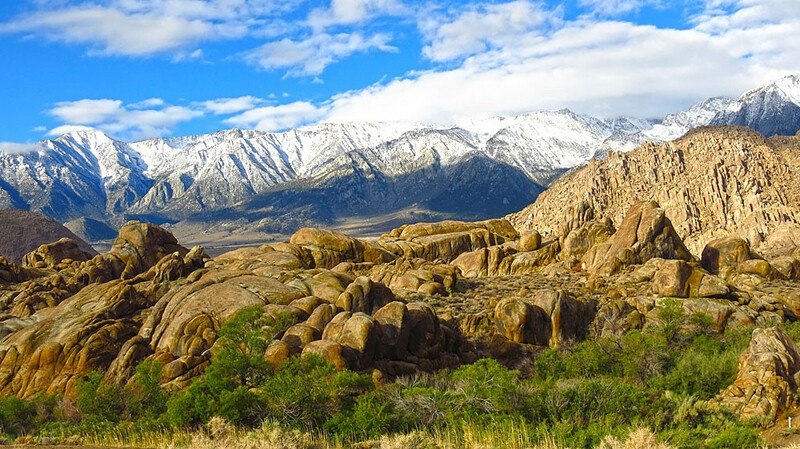 Hundreds of old cowboy movies were made in the area with the likes of John Wayne, Gene Audry, Clayton Moore and Hopalong Cassidy. 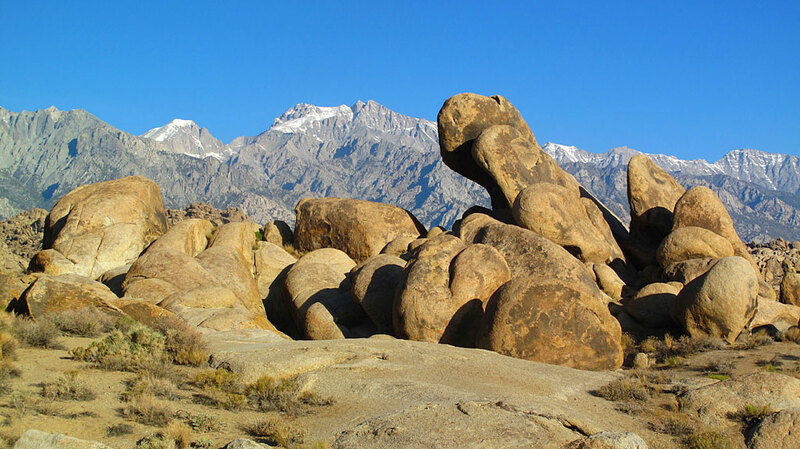 Was it just us, or did the rock at our camp look like the Simpson’s characters Kang and/or Kodos? 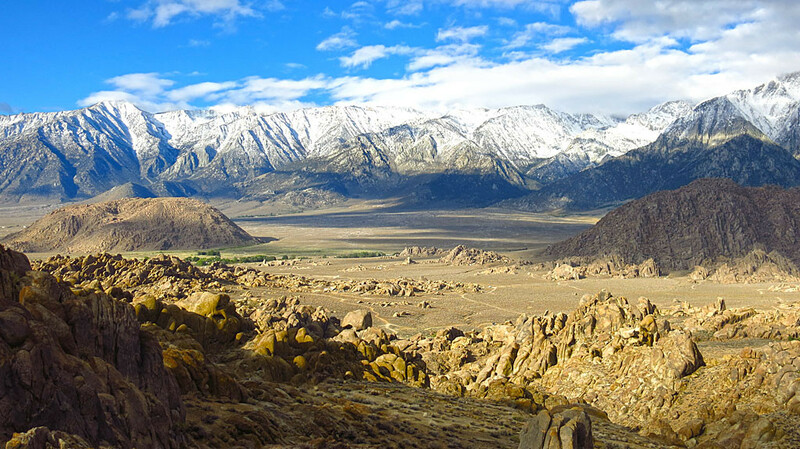 The Inyo Mountains framed by the Alabama Hills. 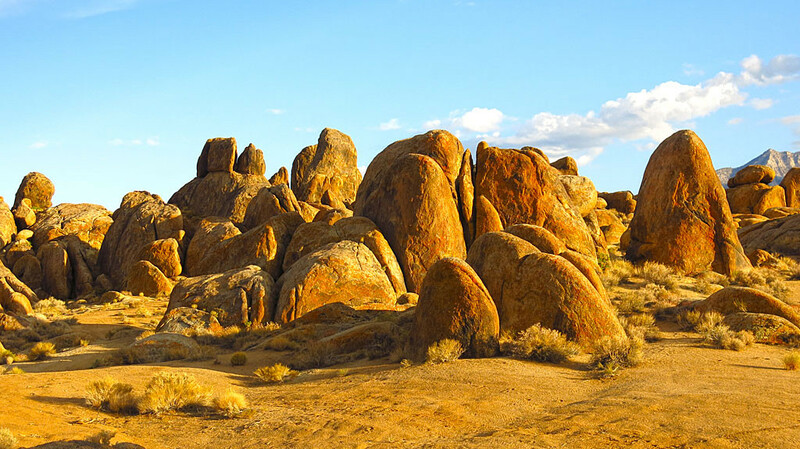 Our dispersed camp site was surrounded by rocks of all sizes – perfect if you’re into bouldering or if you’re a kid. 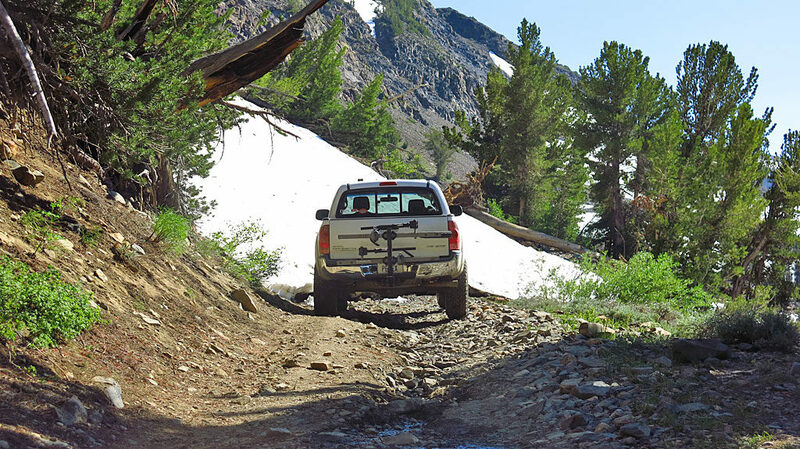 Lubken Canyon Road passing through pastureland on our way to Horseshoe Meadows and the Cottonwood Lakes trailhead. 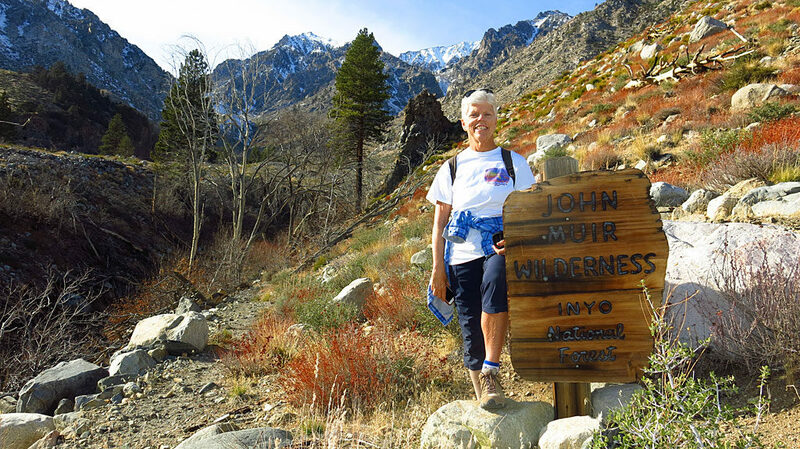 On the Cottonwood Lakes Trail, we passed from the Golden Trout Wilderness into the John Muir Wilderness – the transition was relatively painless. 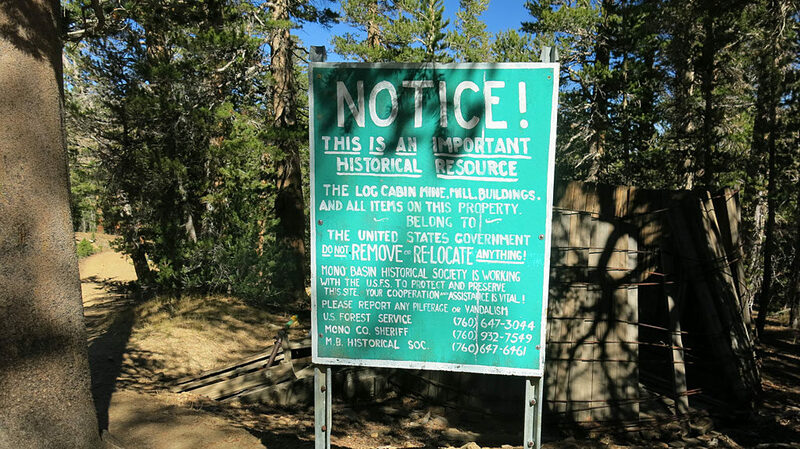 A little farther down the trail, we saw the Golden Trout camp – a group of old houses which are reportedly home to a family of bears. Note the funny leg. 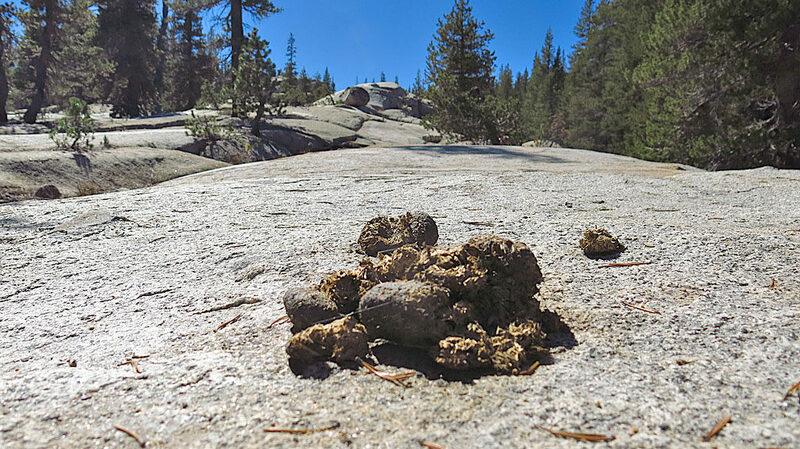 By the way, mountain bikes are not welcome in wilderness areas, but horses are. 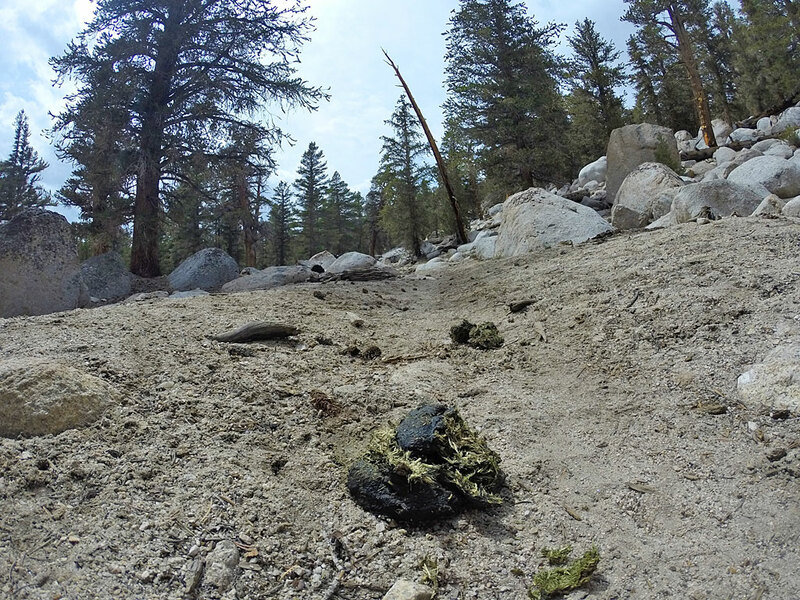 The issue appears to be the mountain bike’s inability to defecate on the trail and create deep gouges. 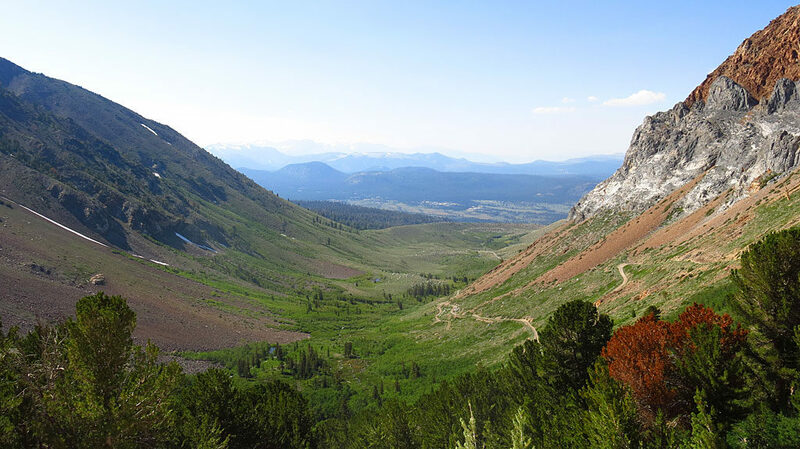 As we approached Cirque Peak and Cottonwood Lakes (there’s six Cottonwood Lakes), the trail flattened out at around 11,100′. 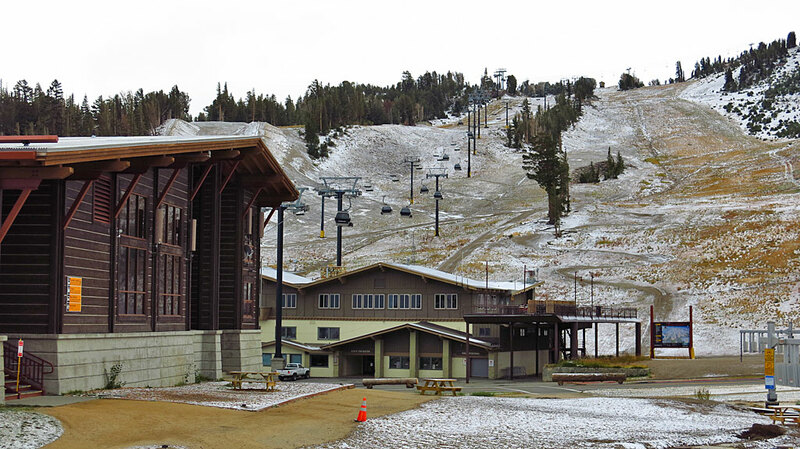 Temps were chilly – we received some snow flurries. 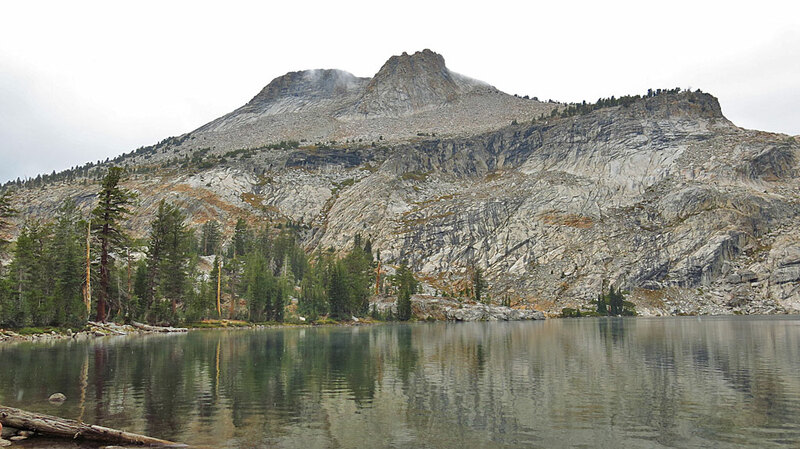 Cirque Peak and Cottonwood Lake – this would be our turn-around point, 7.5 miles from the car. 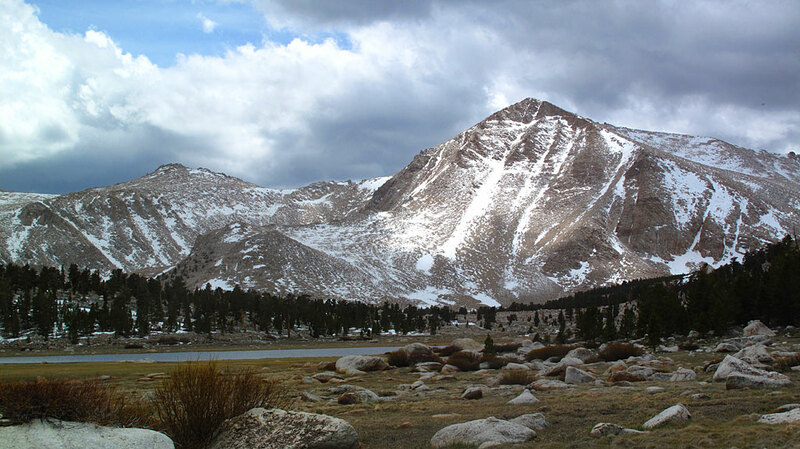 From Cottonwood Lakes, we had a great view of Mt. Langley, 14,042′, standing almost 3,000′ above our picture-taking location. 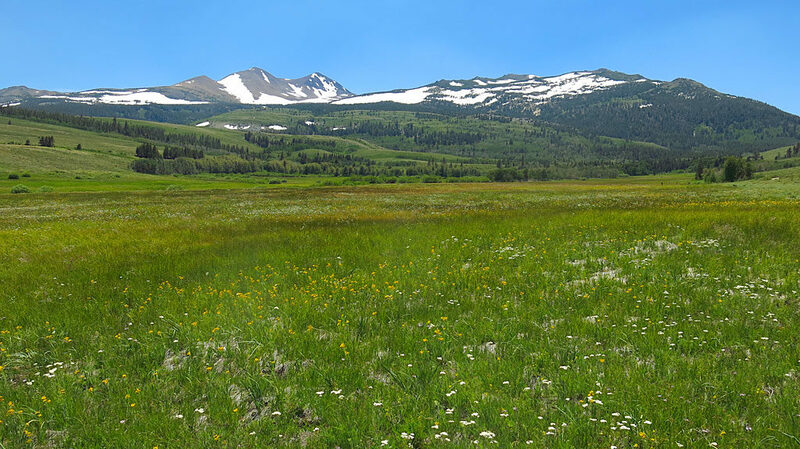 Langley is the southern-most of the 14ers. 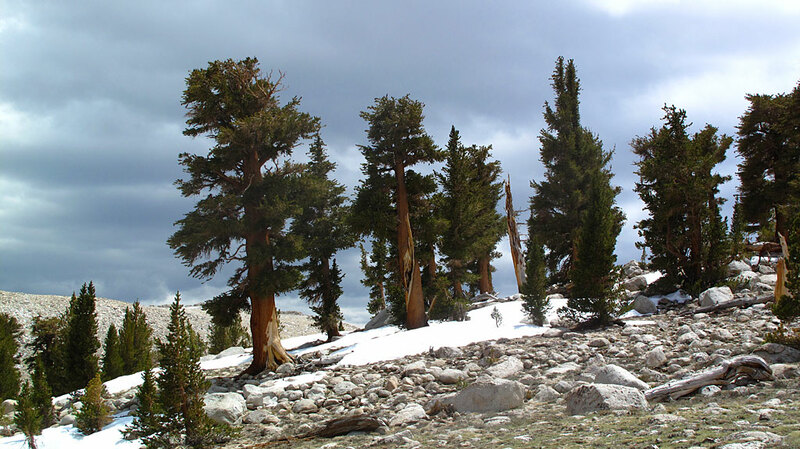 The trees at timberline appeared to have had a rough life. Pausing to layer and/or unlayer. 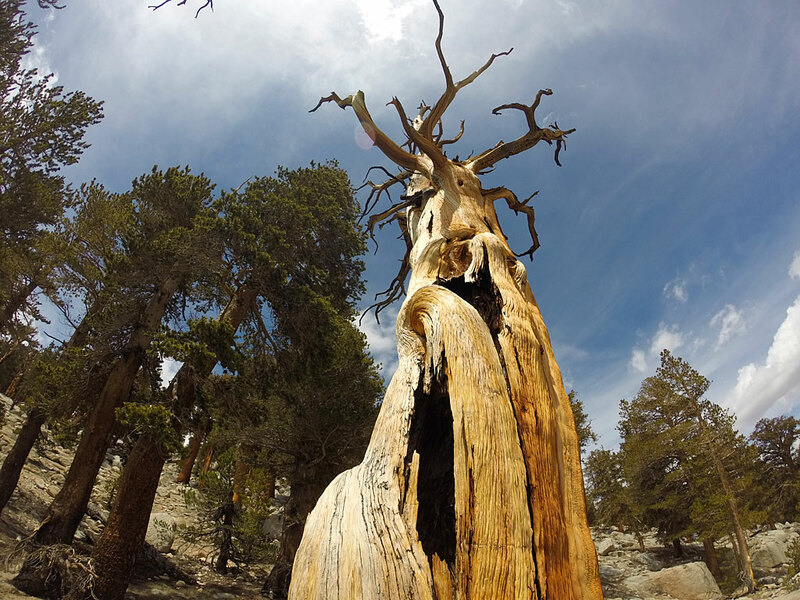 We got to see some very cool weathered trees along the trail. 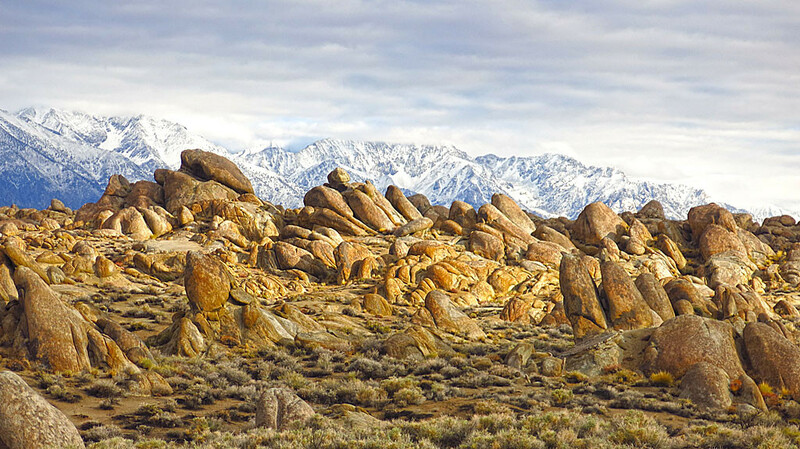 Sunday morning sunrise in the Alabama Hills. 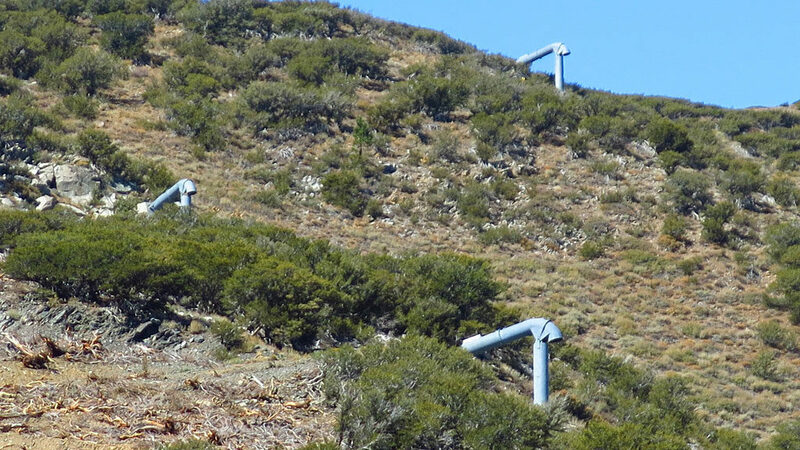 That tall, weird-shaped rock? It’s about 30′ tall, thanks for asking. 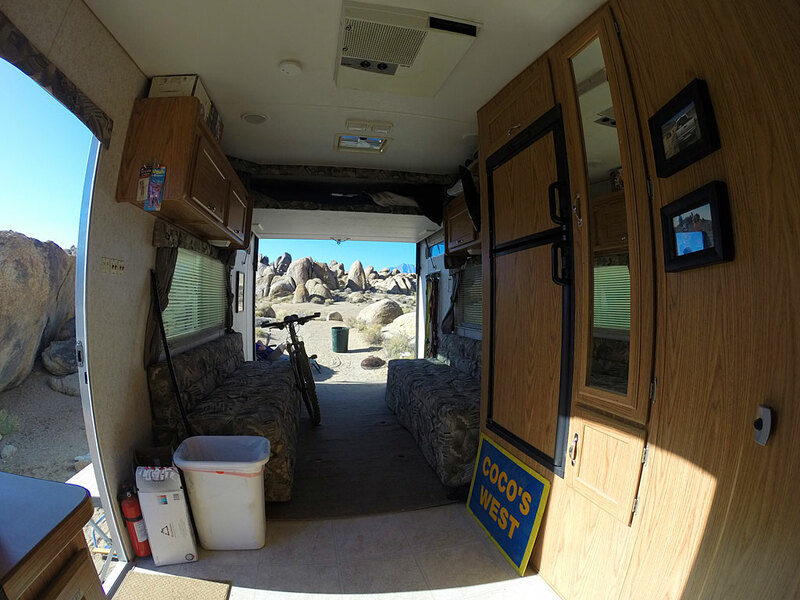 And the view from within the toy hauler wasn’t too bad either. 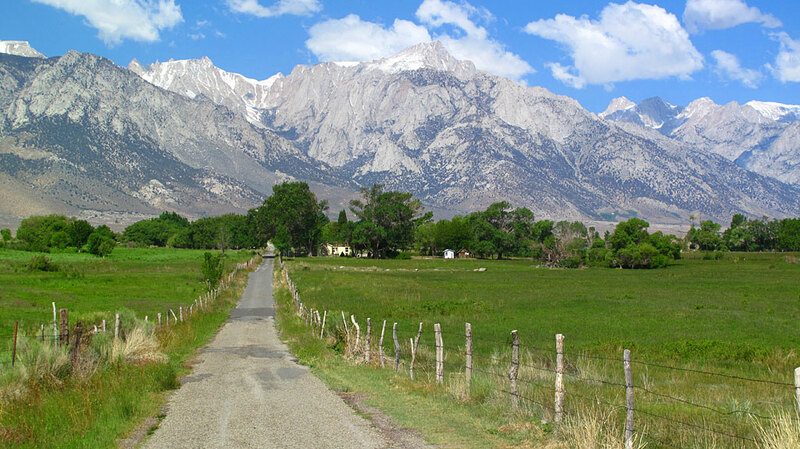 Among other things, on Sunday we drove up to Whitney Portal and had lunch. 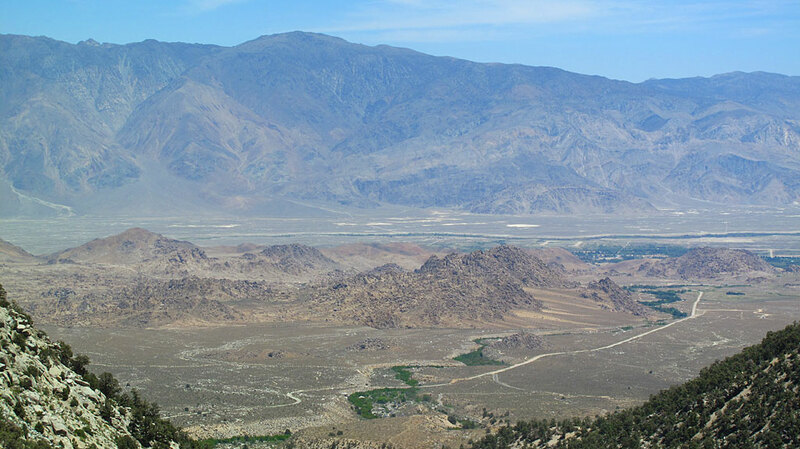 In the middle of the photo are the Alabama Hills – the town of Lone Pine is located in that green mass on the right. 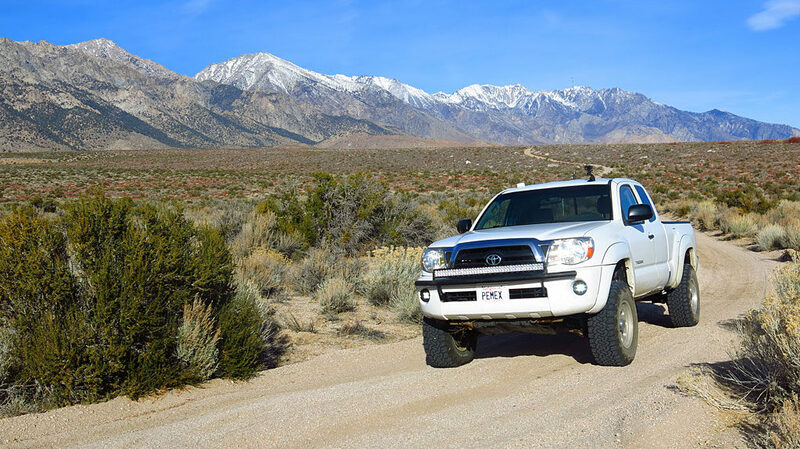 That’s the Inyo Mountains on the east side of the Owens Valley. 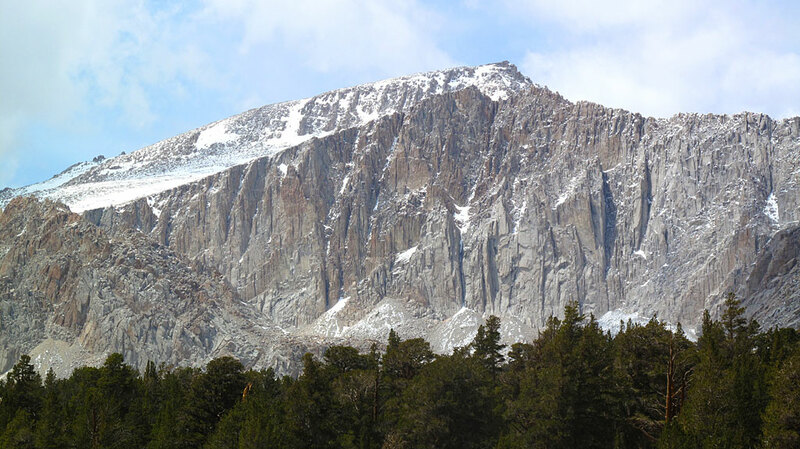 Looking up at the granite walls above Whitney Portal. 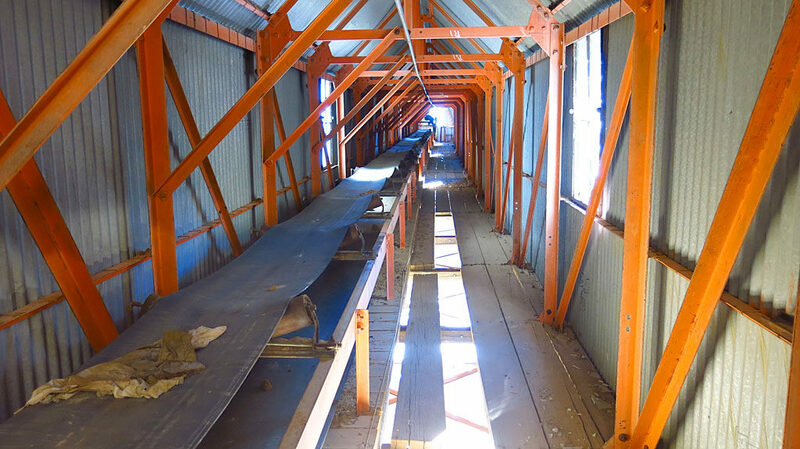 For whatever reason, recent guy wires and a steel frame were added to the tower – arrested decay? 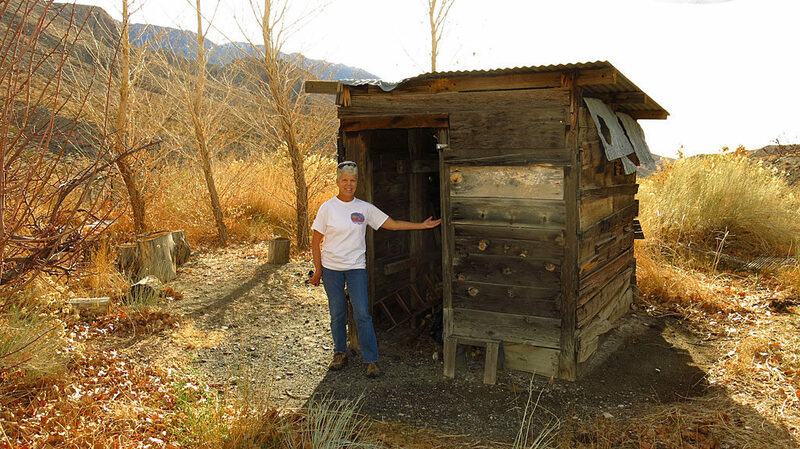 An old shack on Moffat Ranch Road, overlooking Owens Valley. 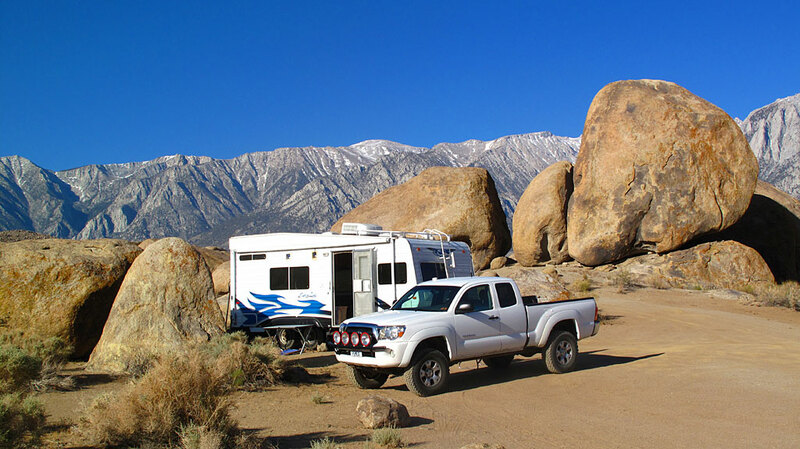 One of our favorite Cocktail Rocks, overlooking the Eastern Sierras and the Alabama Hills (if you look closely, you can see the toy hauler).